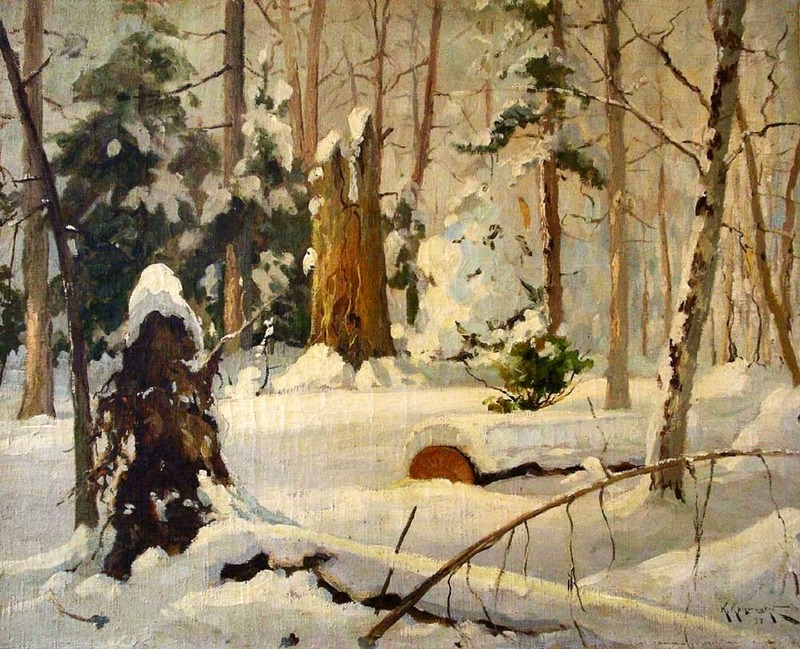 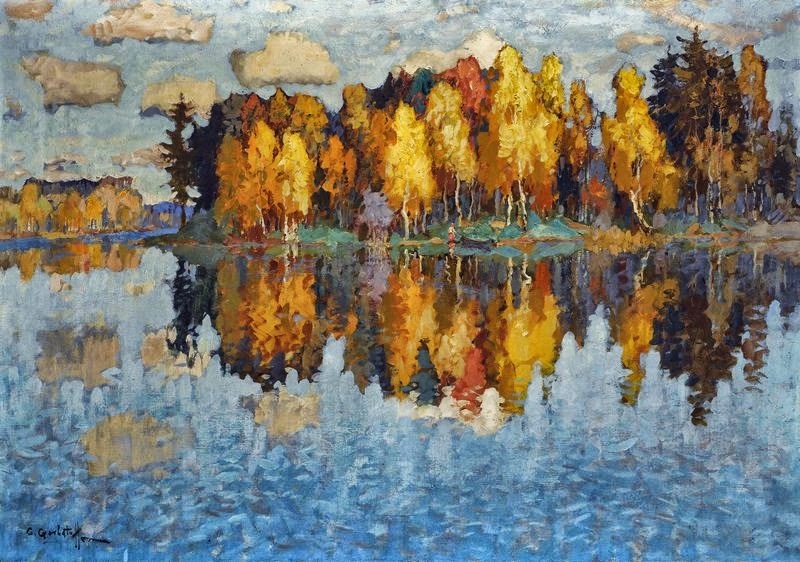 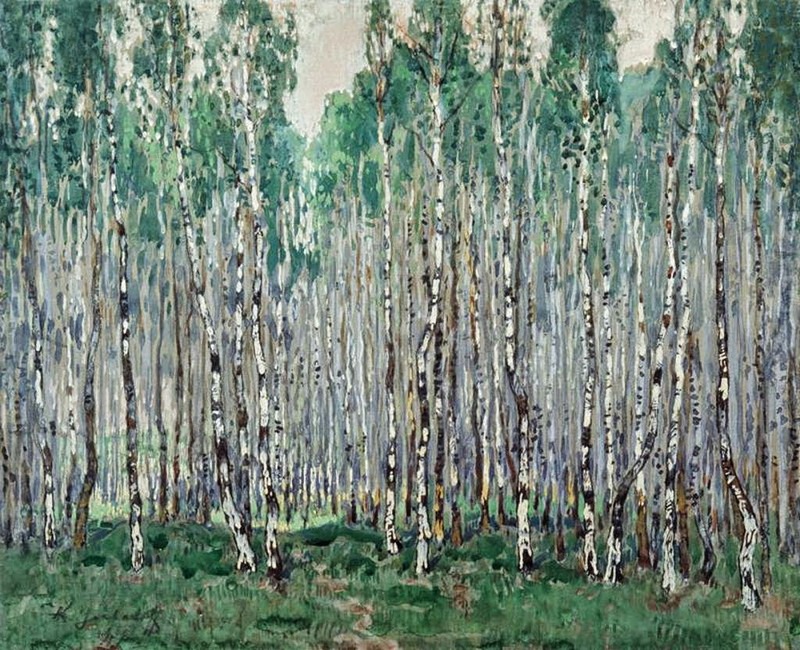 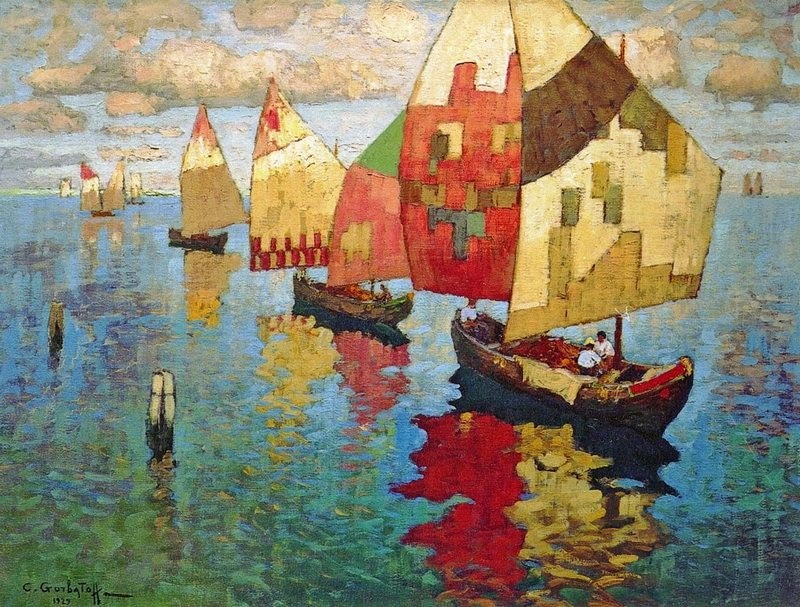 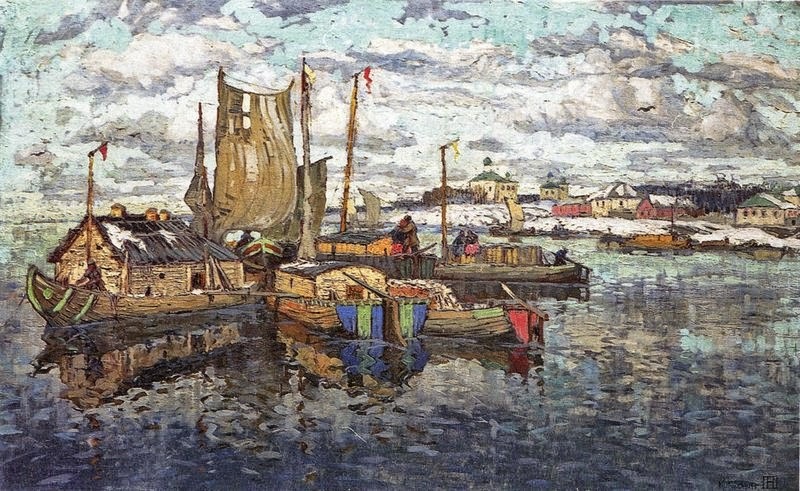 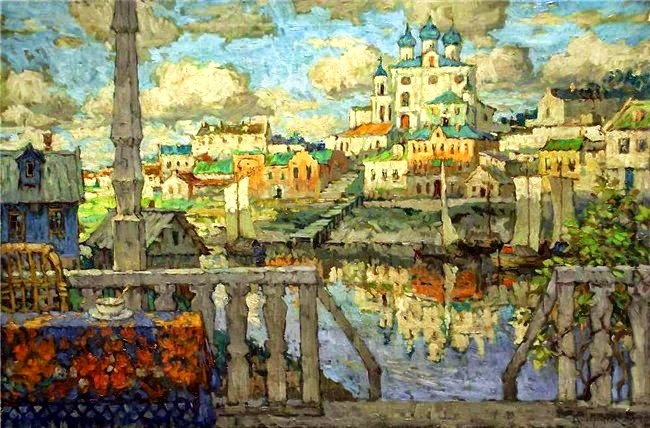 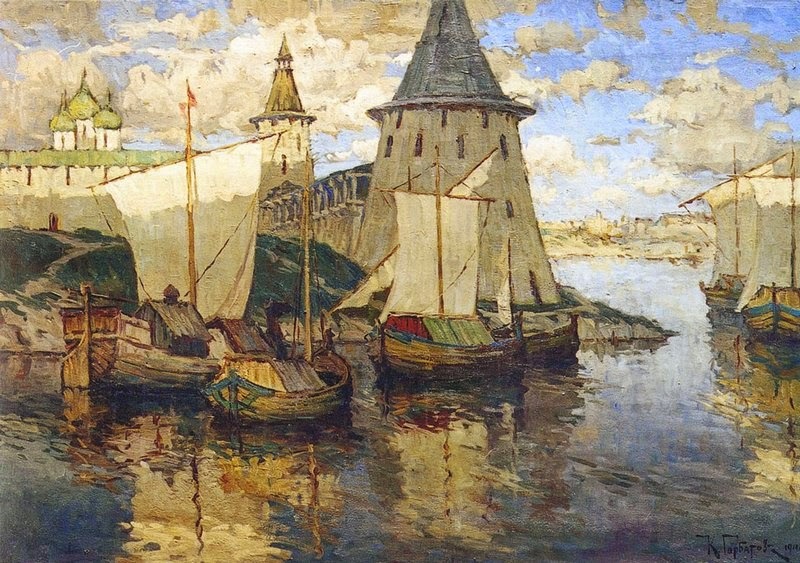 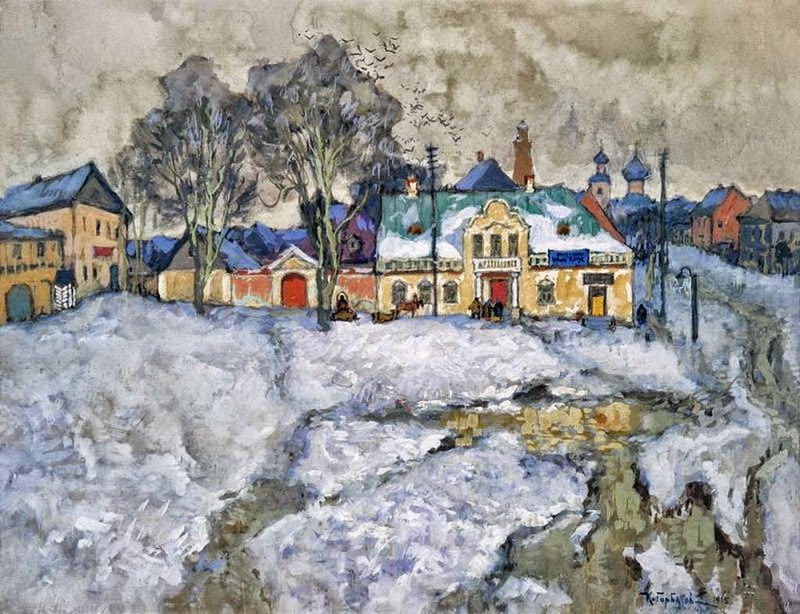 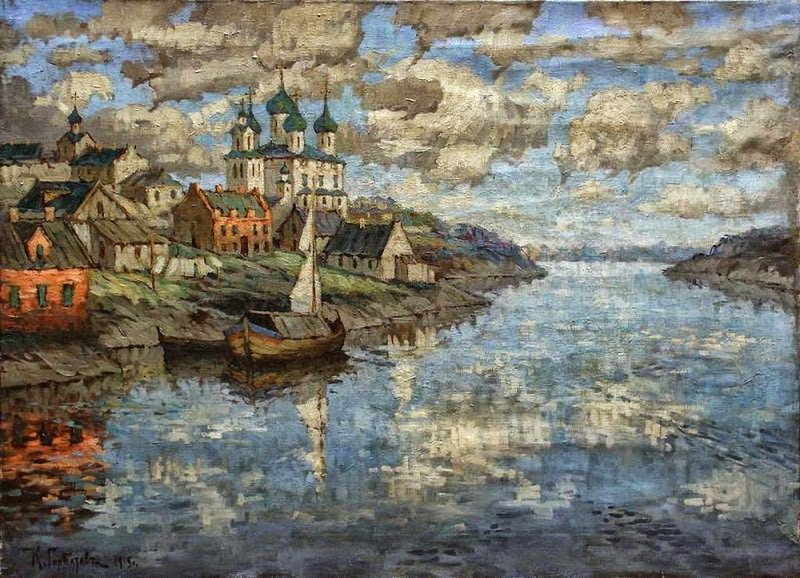 Kонстантин Иванович Горбатов [1876-1945) was a Russian post-impressionist painter. Gorbatov was born in the small Volga river town of Stavropol. 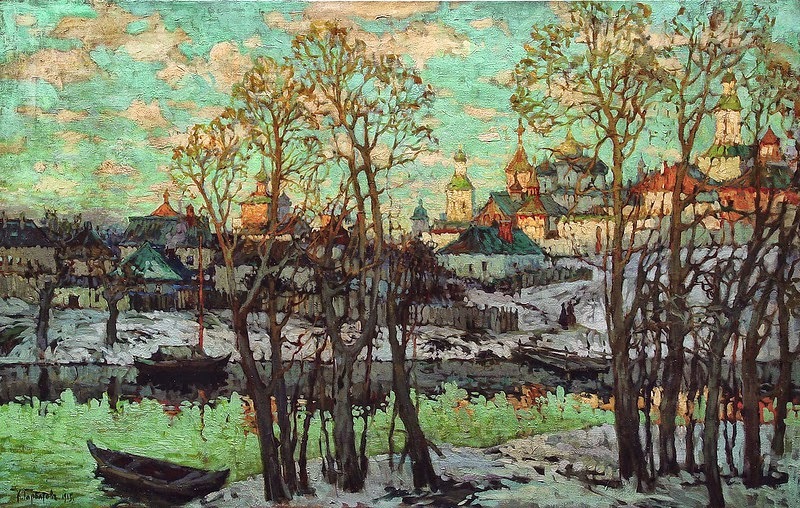 After initially studying architecture at the St. Petersburg Academy of Fine Arts, he transferred to the painting department where he studied under Nikolai Dubovskoy and Aleksandr Kiselev, though he was most influenced by Ilya Repin and Arkhip Kuindzhi. 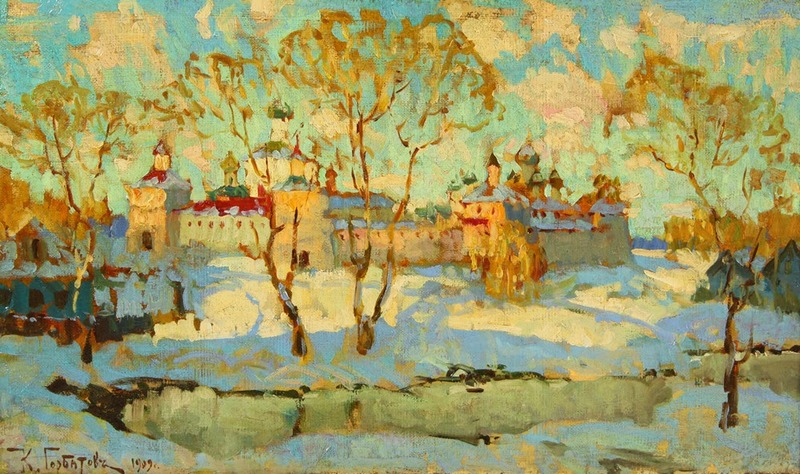 In 1911, Gorbatov was officially granted the title of Artist and awarded a gold medal at an international exhibition in Munich. 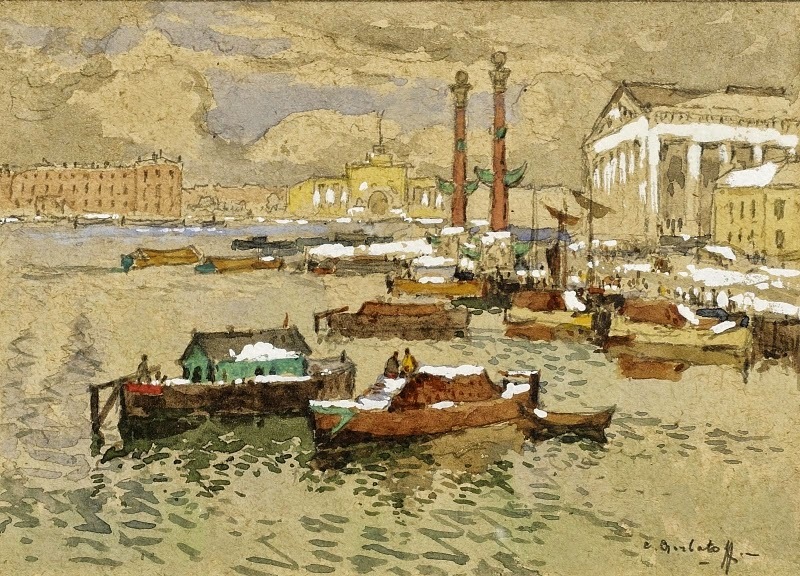 The following year he traveled to Europe on scholarship, stopping in Capri to visit Gorky. 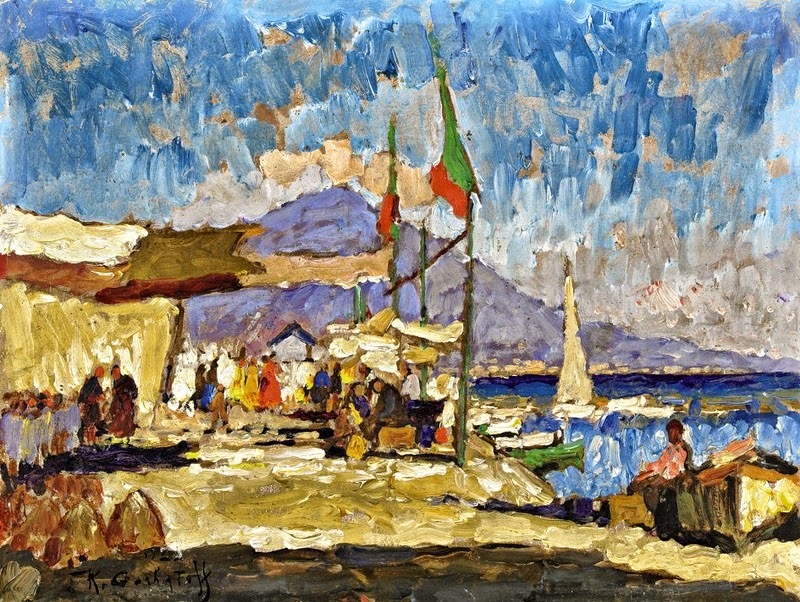 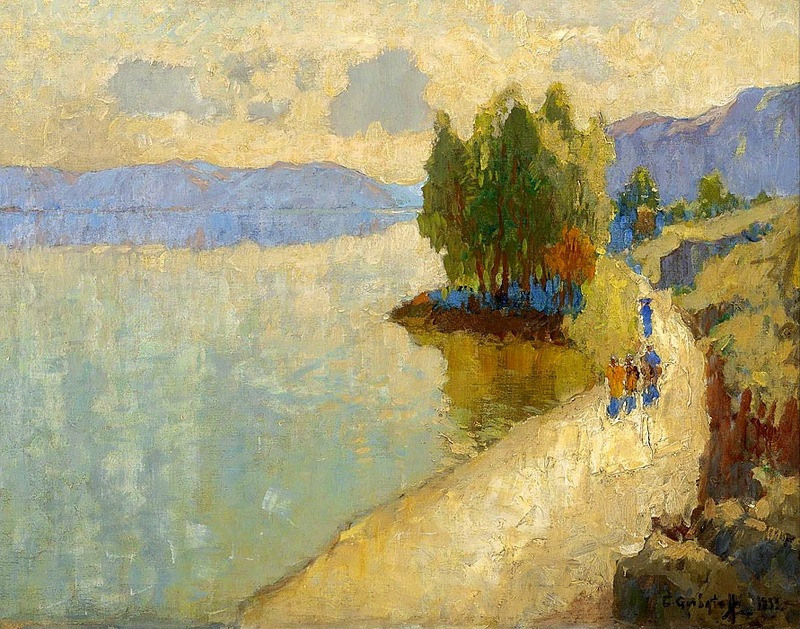 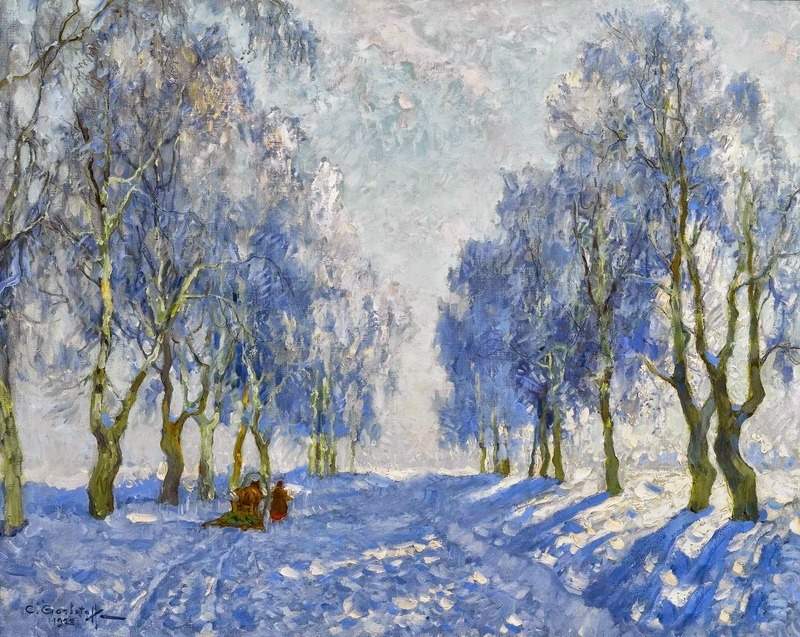 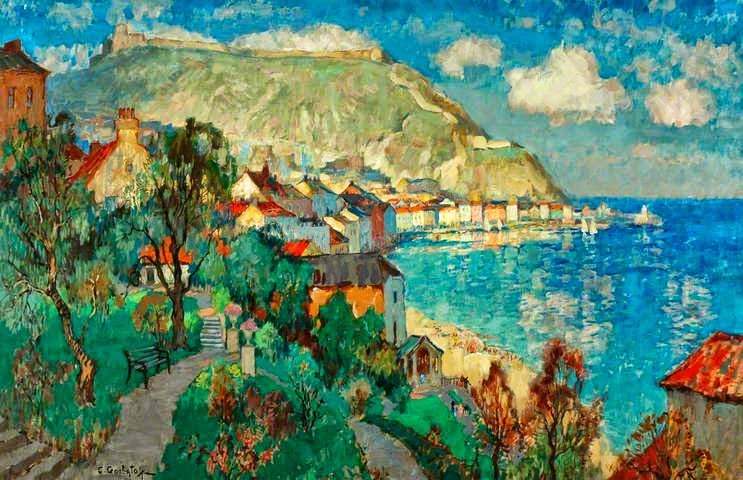 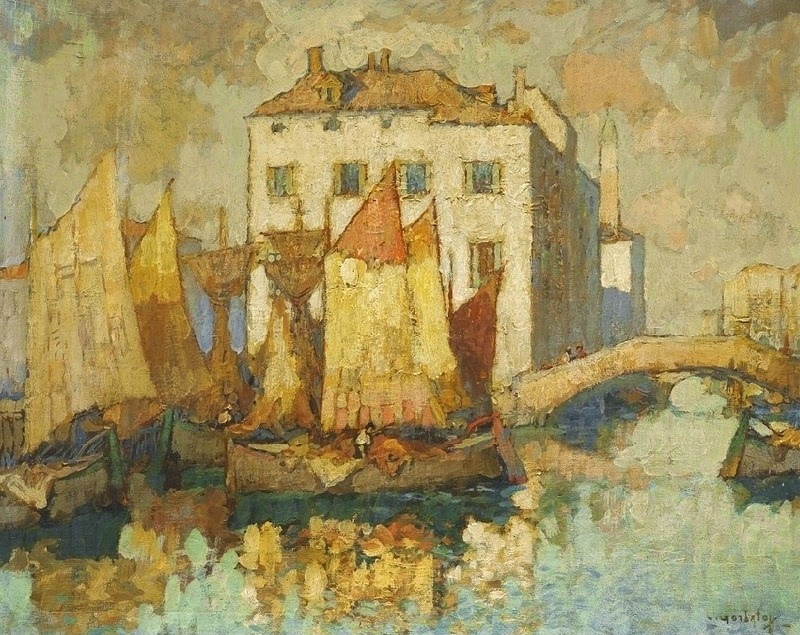 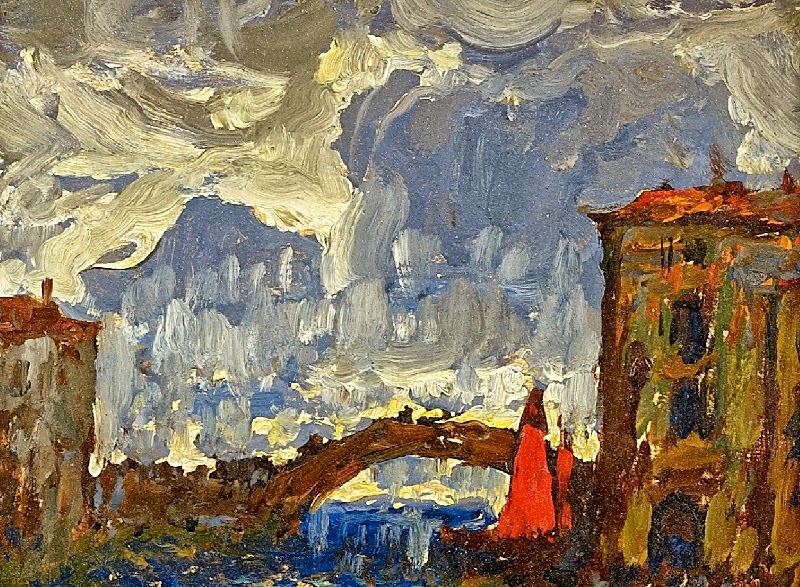 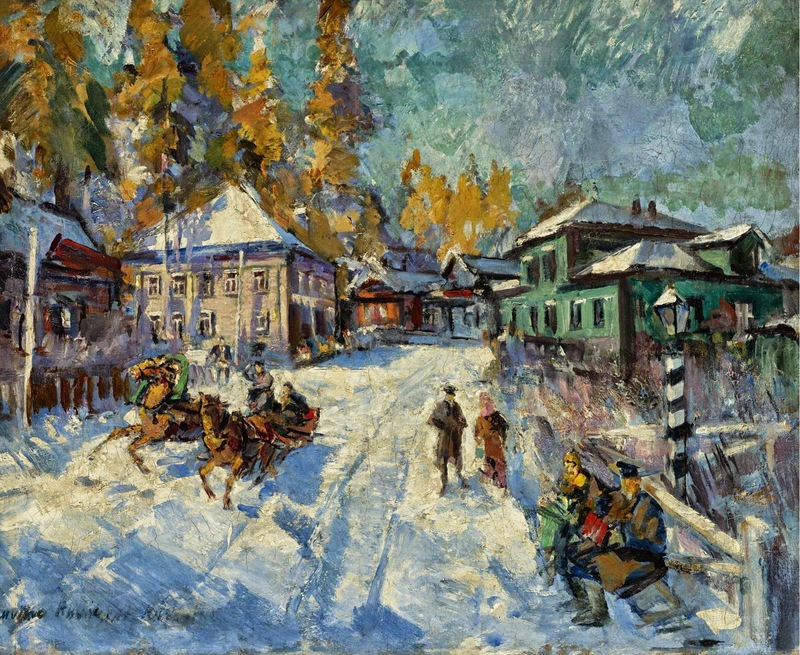 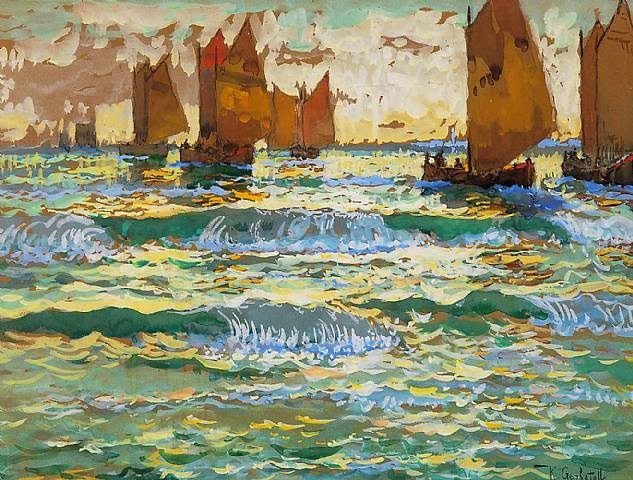 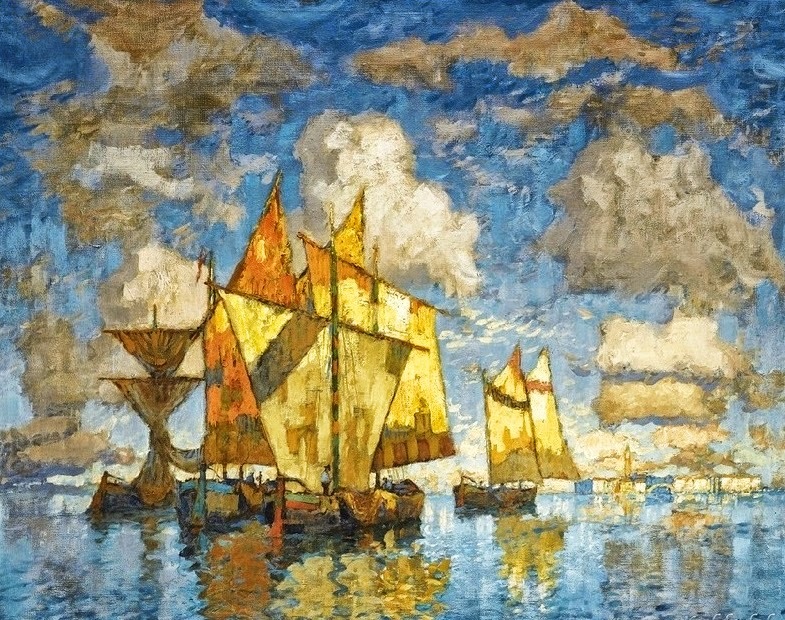 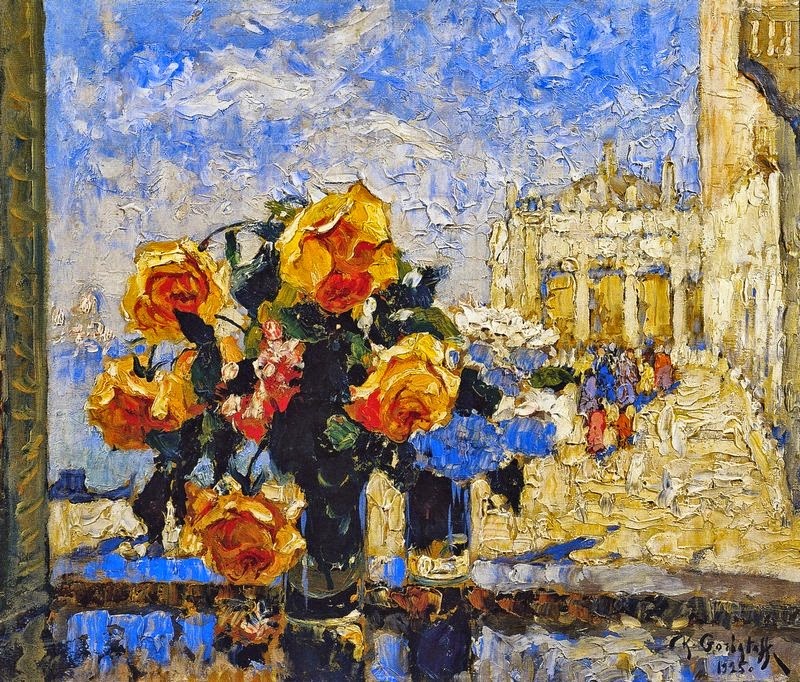 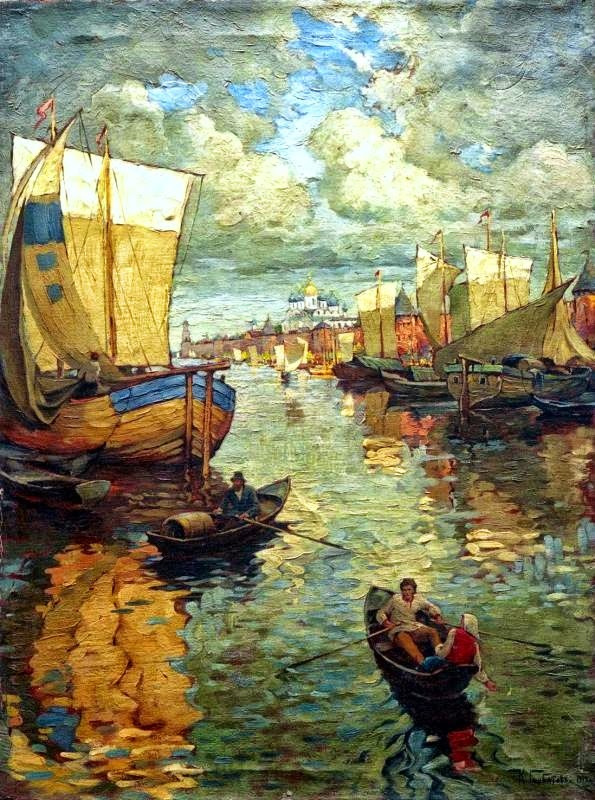 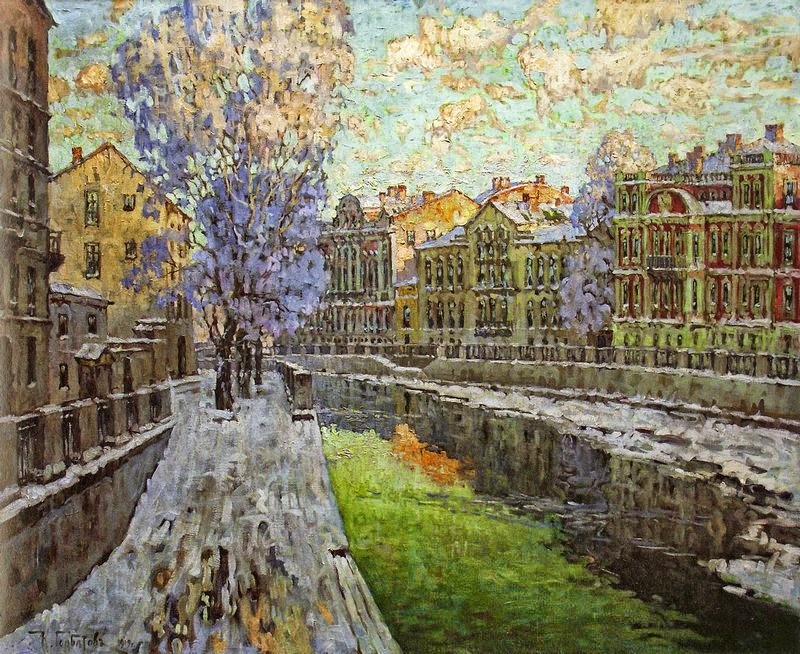 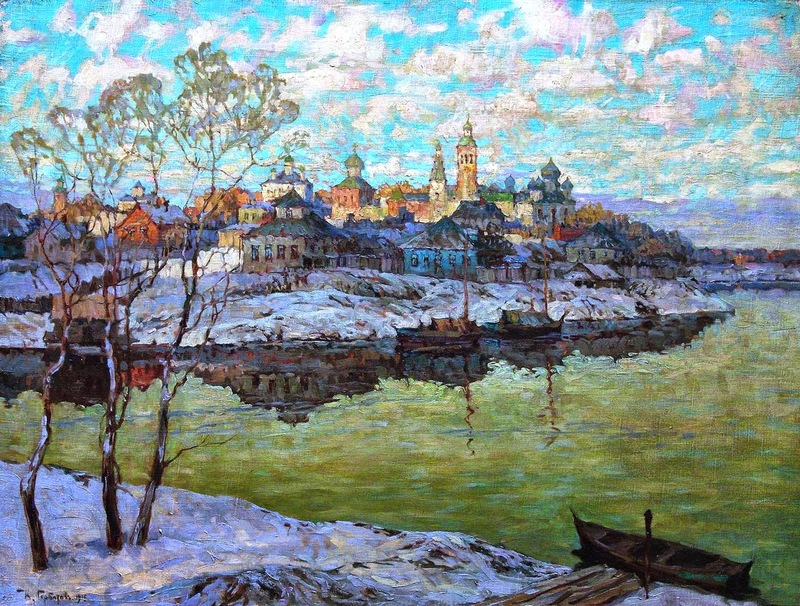 Gorbatov fell in love with Italy during this first visit, and he began to experiment and perfect his unique Impressionistic style. 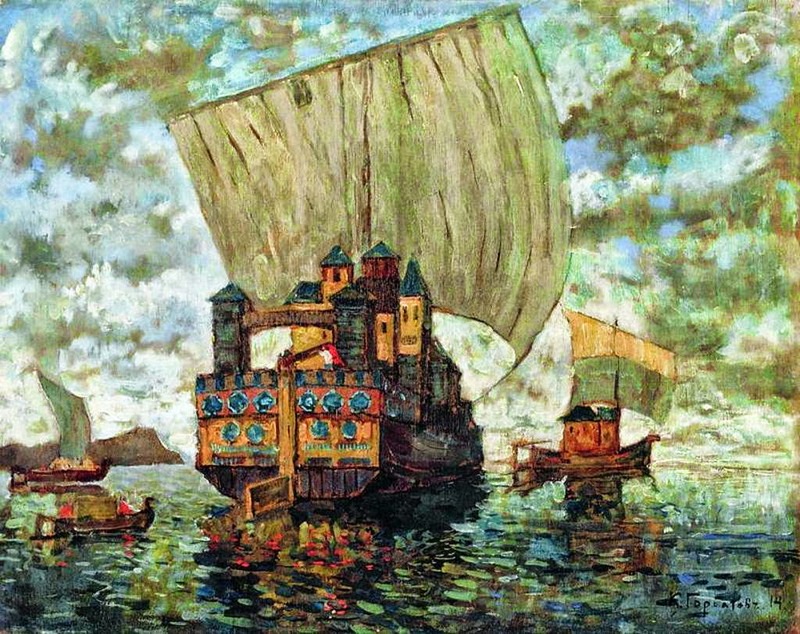 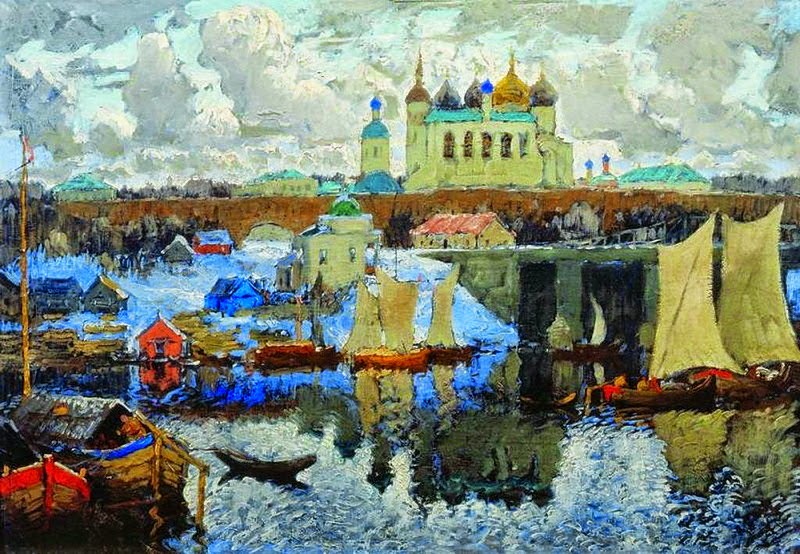 He returned to Russia and continued to develop his technique, but he was criticized for his Romantic renderings, which appeared to favor beauty over realism. 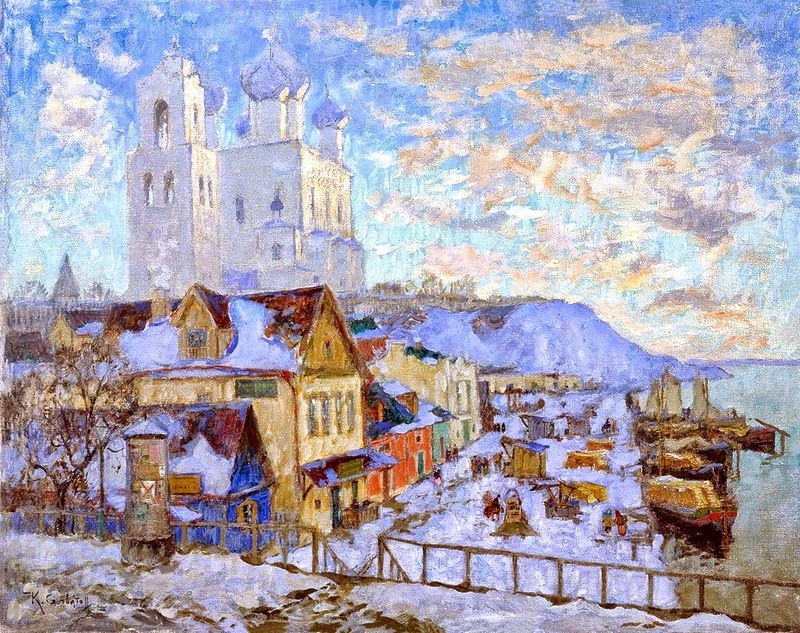 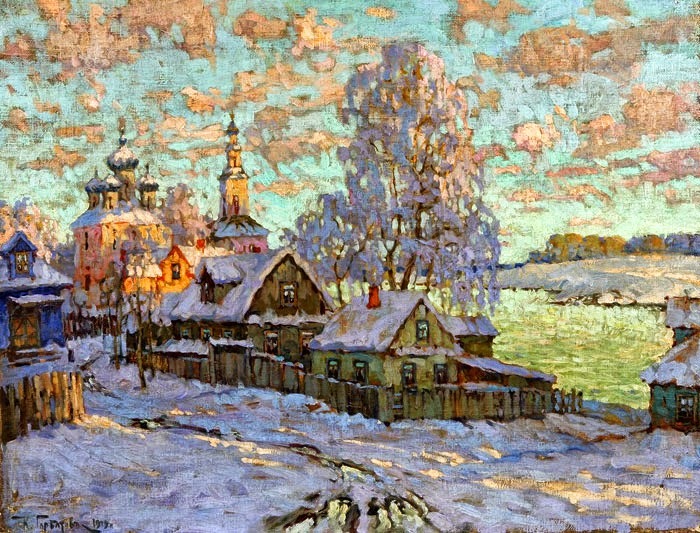 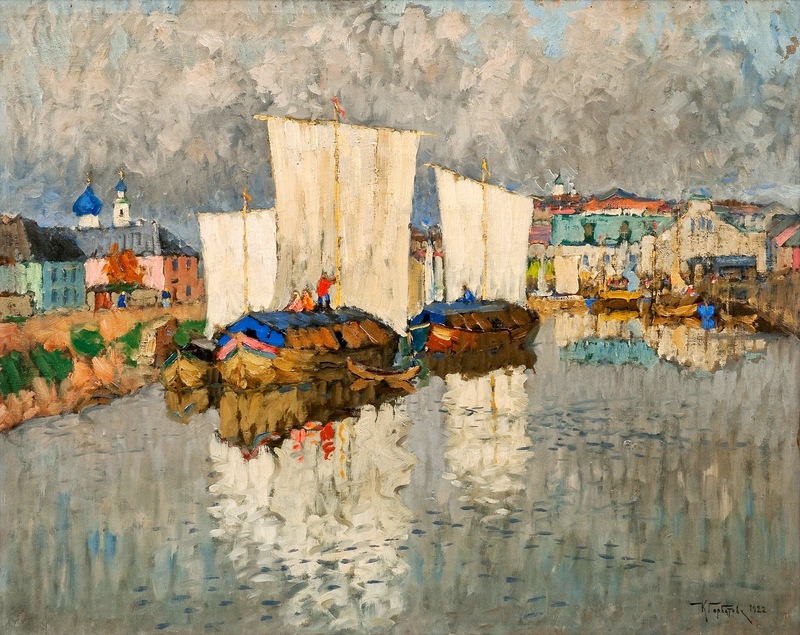 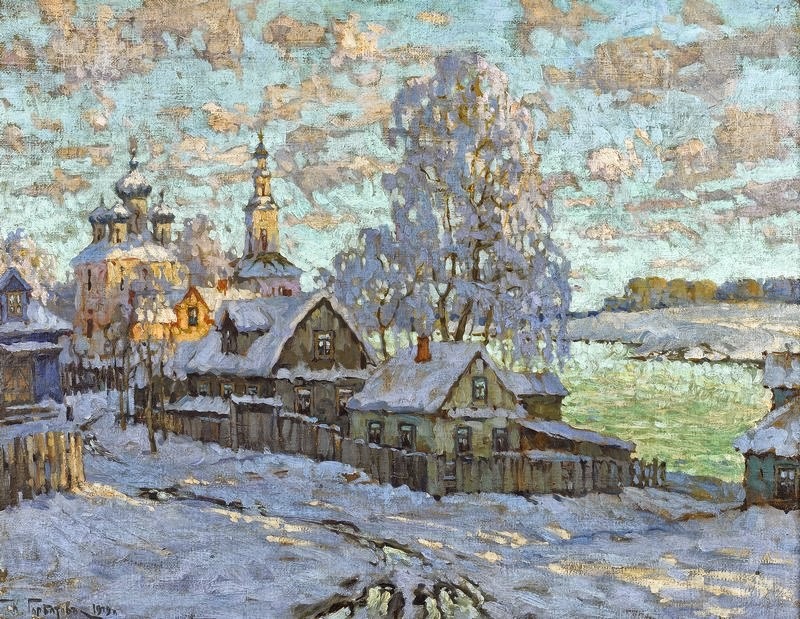 At that time the environment in Russia was not supportive of un traditional artists; critics rejected Impressionist ideals and scorned art as a means to financial success. 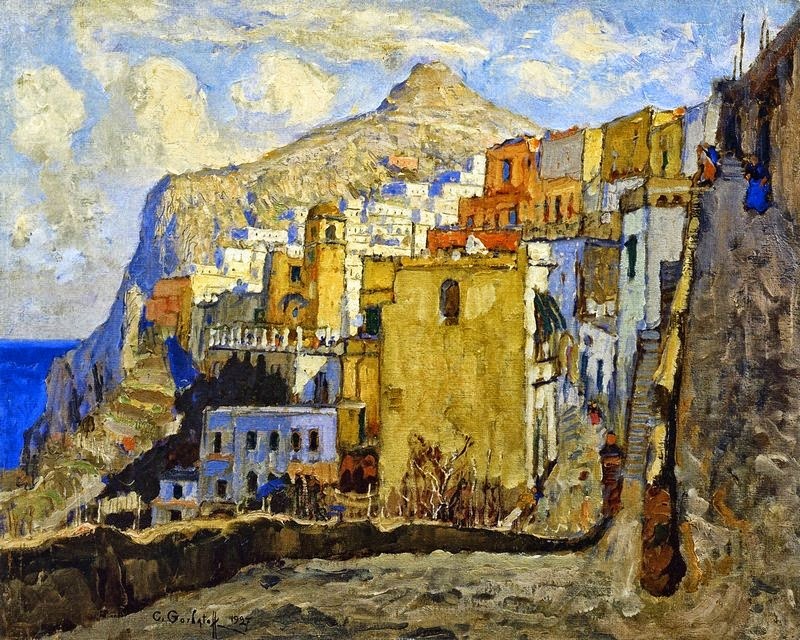 Gorbatov returned to Capri in 1922, leaving behind a country torn apart by revolution. By contrast, Italy was the perfect home for the artist; here mained there until 1926, traveling between Capri and Venice, finding inspiration in the colors and warmth of the Italian countryside. 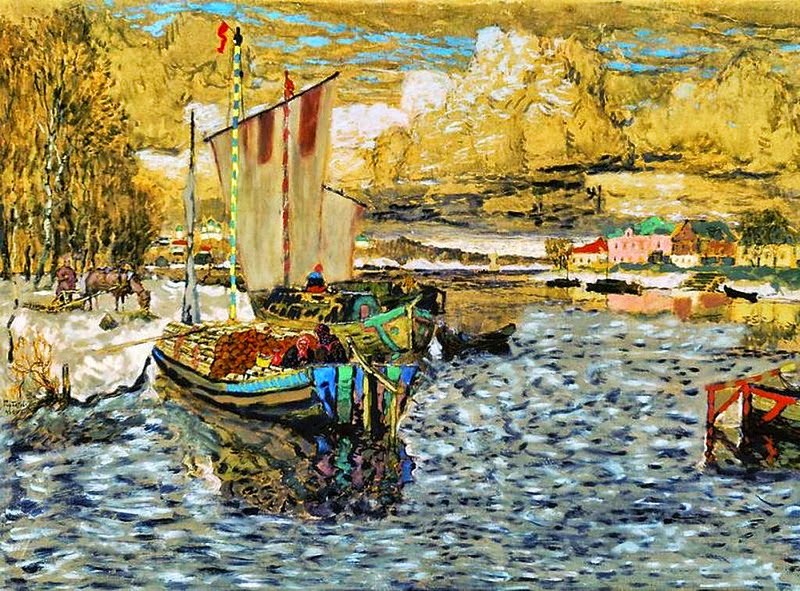 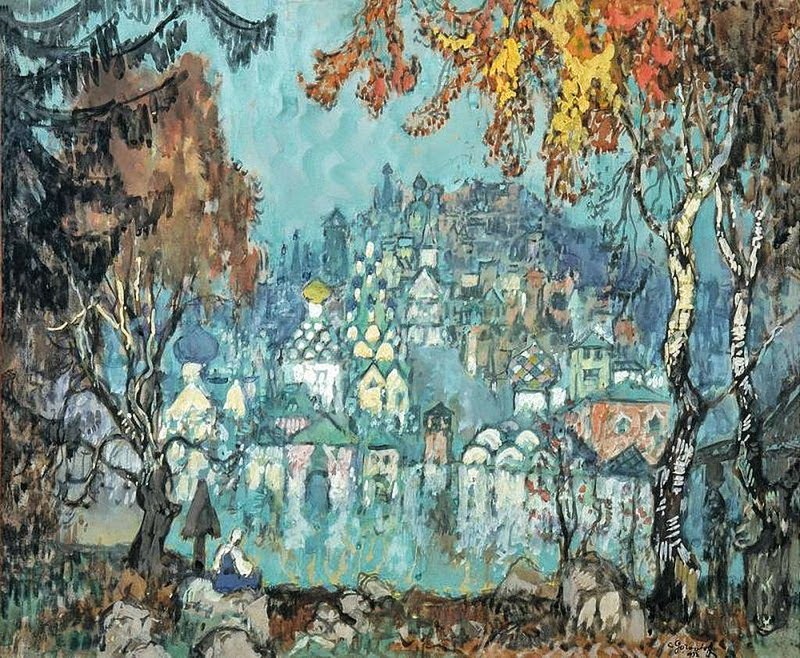 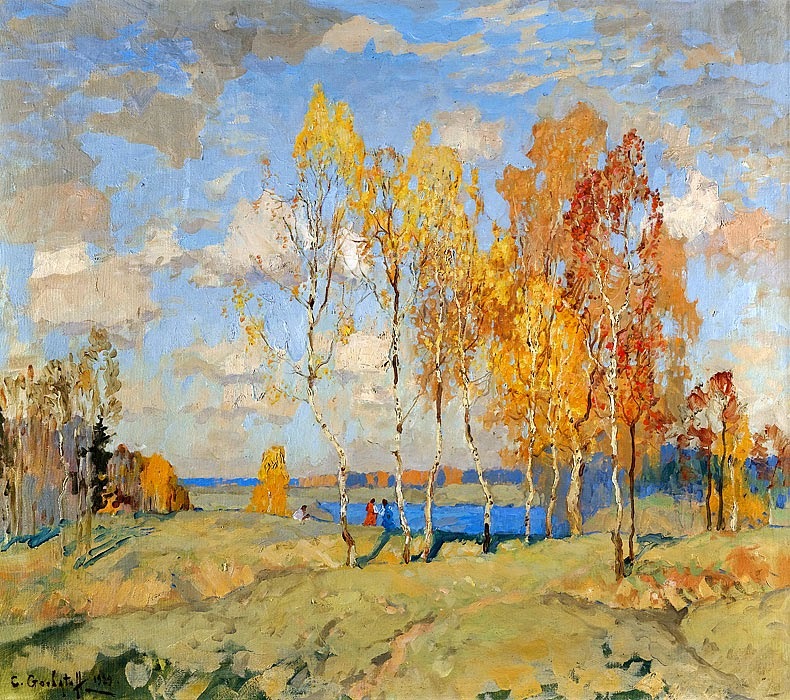 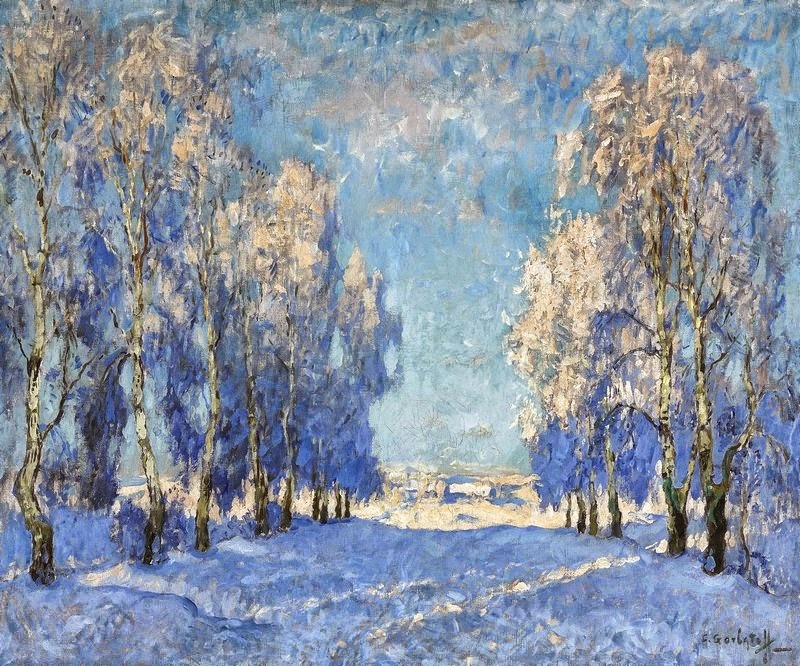 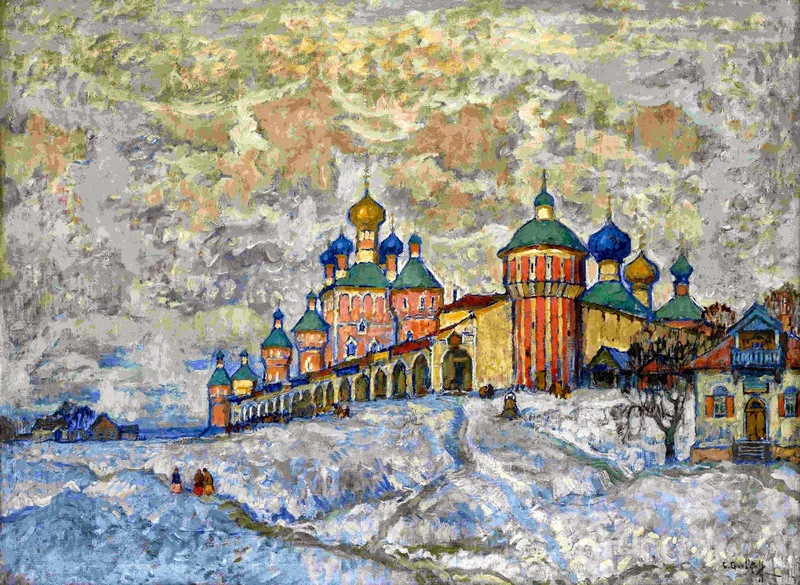 Finally freed from the artistic restrictions of post-revolutionary Russia, Gorbatov fused Impressionistic technique with Romantic tendencies inspired by Kuindzhi, creating art that "depict[ed] life not the way it is but the way it could be" (The New Hermitage Museum, Konstantin Gorbatov, 2003). 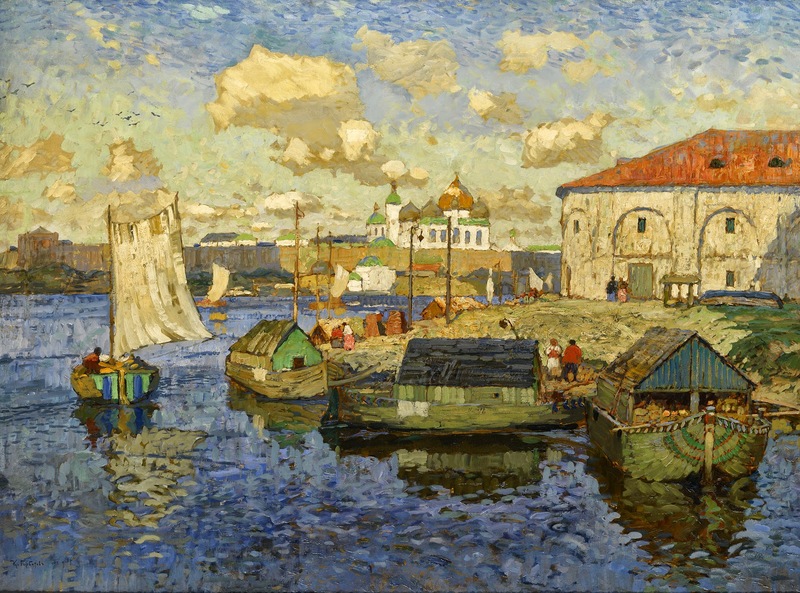 This style was ideal for rendering vibrant and sunny surroundings, and the magical paintings that resulted brought him both artistic respect and considerable profit. 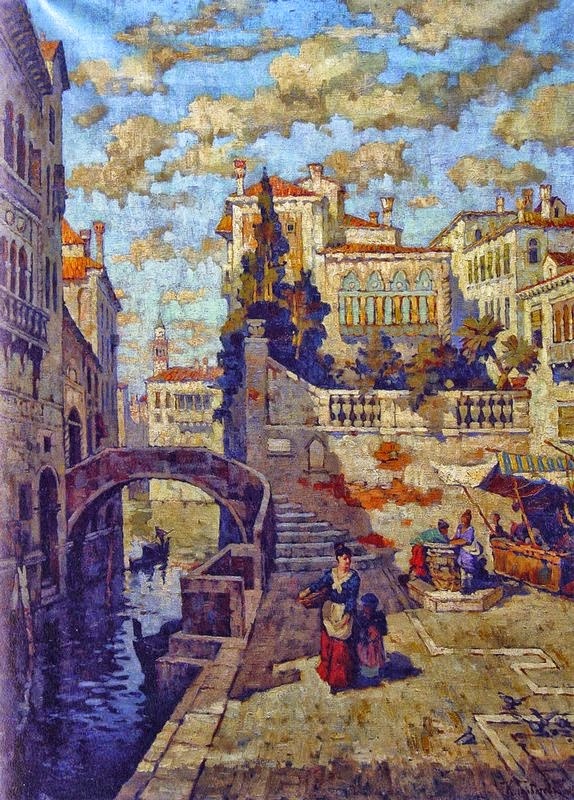 The Italian newspaper Il Messagero commended Gorbatov's artistic talents in an article dated March 14, 1926: "...the heart pounds with joy to see something so dear to us: Naples, Capri, Amalfi, Venice, Ravello. 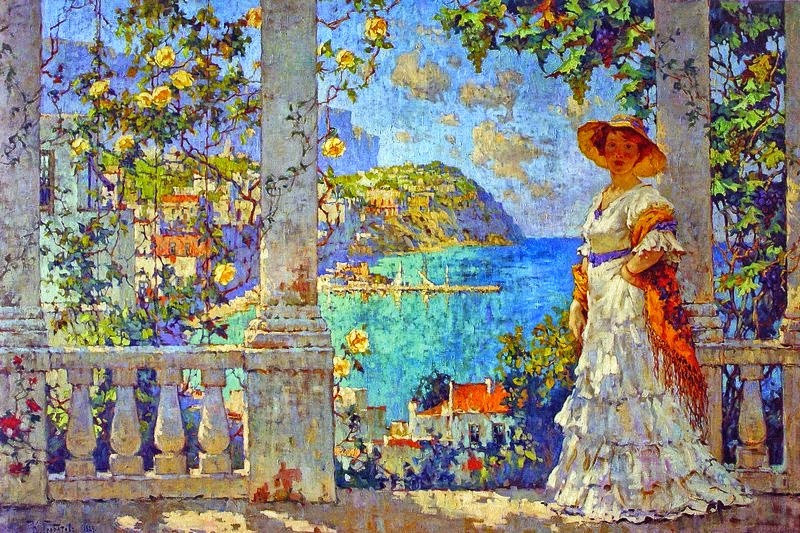 Running grape vines, orange branches, terraces in the sun over our sea. 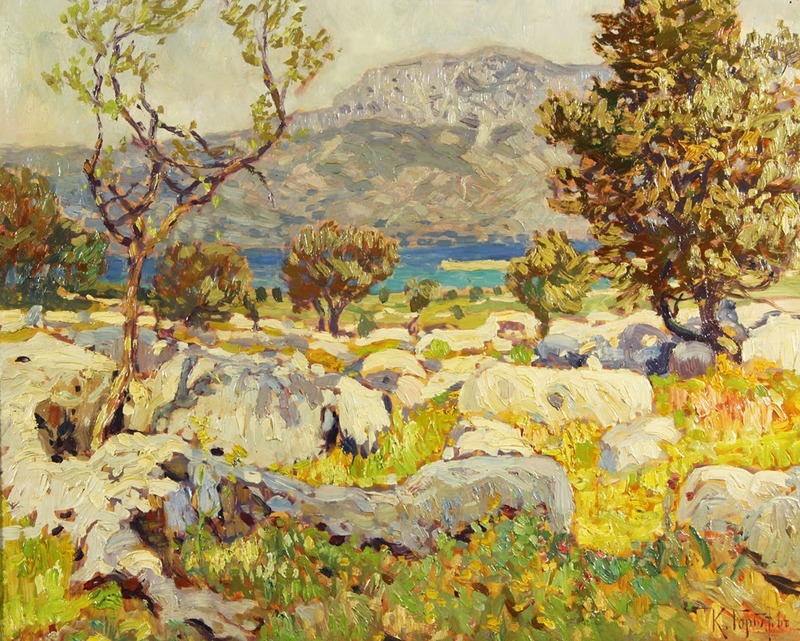 The beauty of the landscape and the sunlight are smoothed by the artist, who has seen nature... 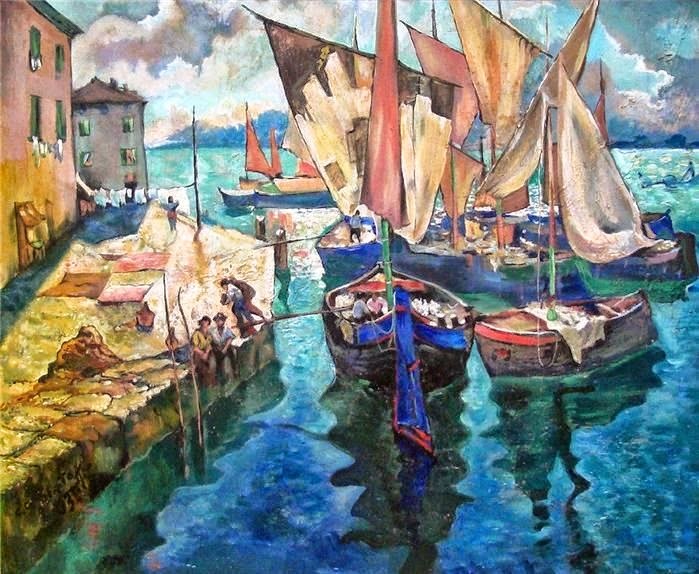 This arouses our sympathy; his feeling is so strong that the artist's reality feels like ours. 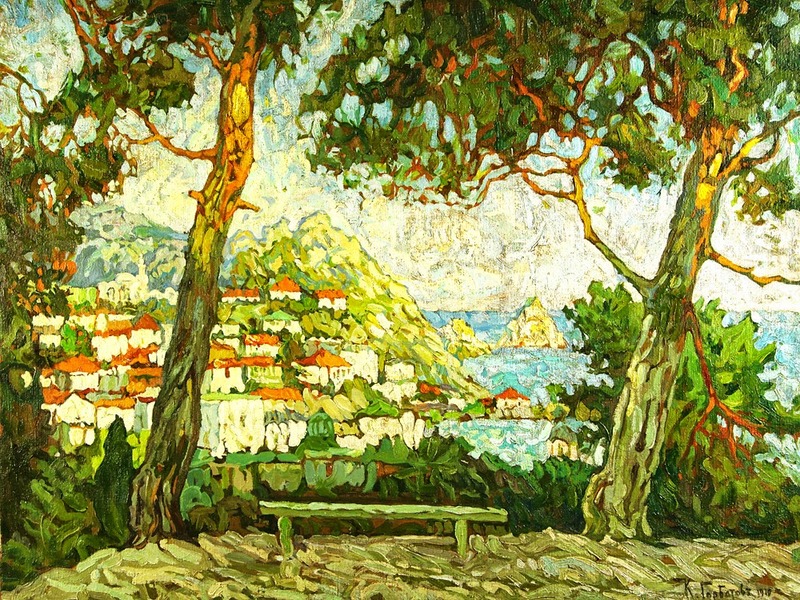 "Patio in Capri" is one of the most striking canvases of Gorbatov's Italian period. 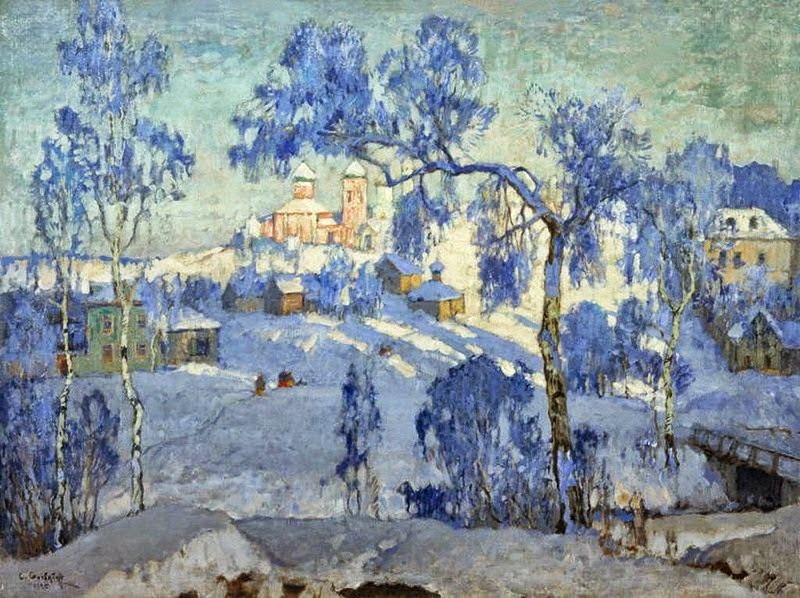 It might be read as an homage to Sylvestr Shchedrin (1791-1830), the early 19th-century landscape artist whose greatest pictures were painted in Italy and were well-known to all Russian painters. 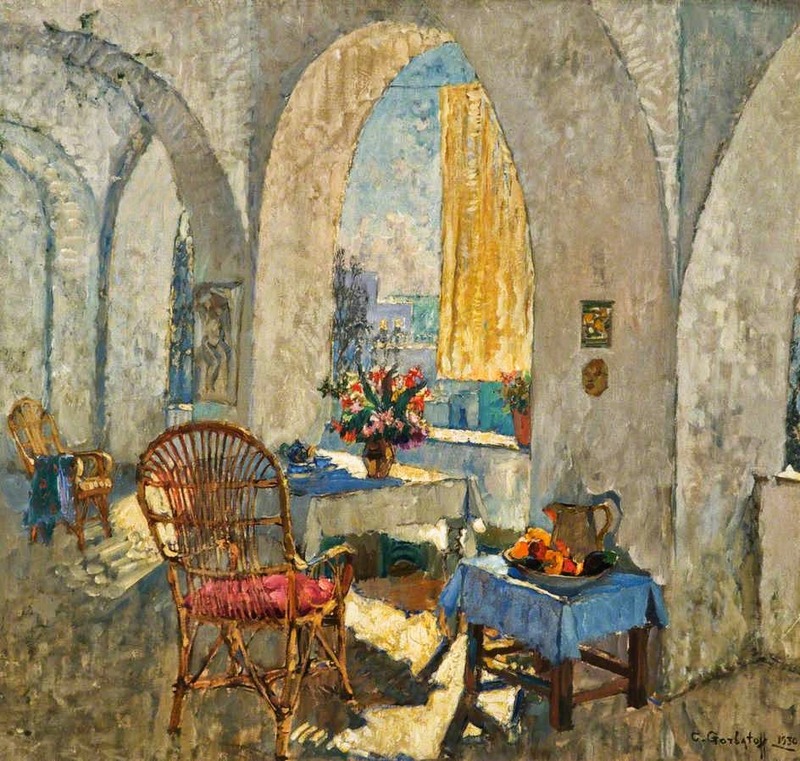 Patio in Capri appears to be particularly inspired by Shchedrin's Terrace on the Sea Coast of 1828, which similarly portrayed the idyllic Italy of the Russian imagination. 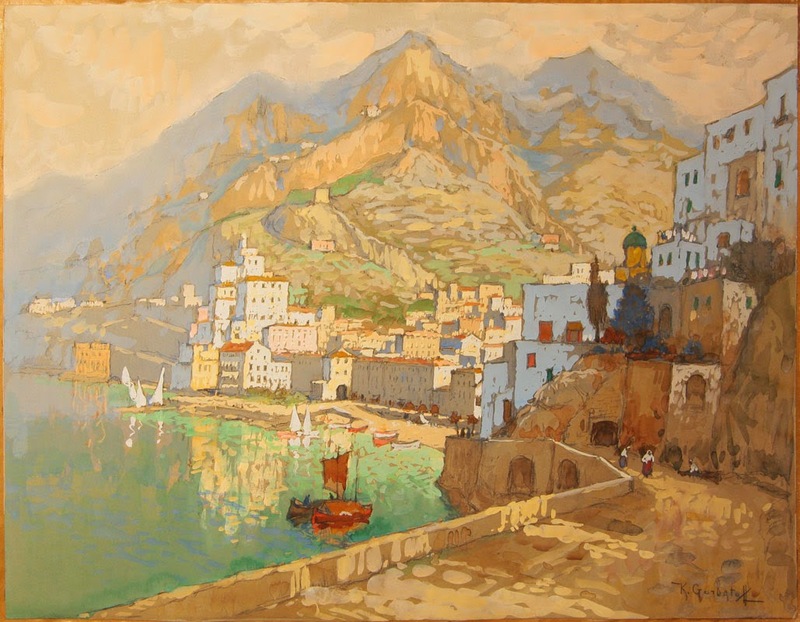 Both compositions depict vine-wrapped terraces above the sea in a seemingly magical place where man and nature exist together inharmonious beauty. 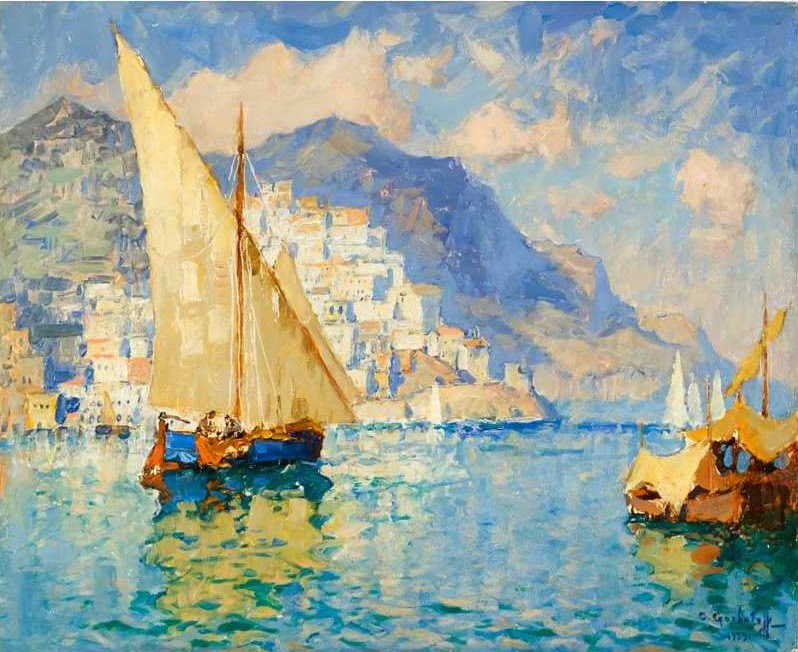 Like Shchedrin, Gorbatov implemented an innovative palette to better evoke the varying qualities of light found along the coast, meanwhile capturing a perfect moment in time, a quiet afternoon in Capri. 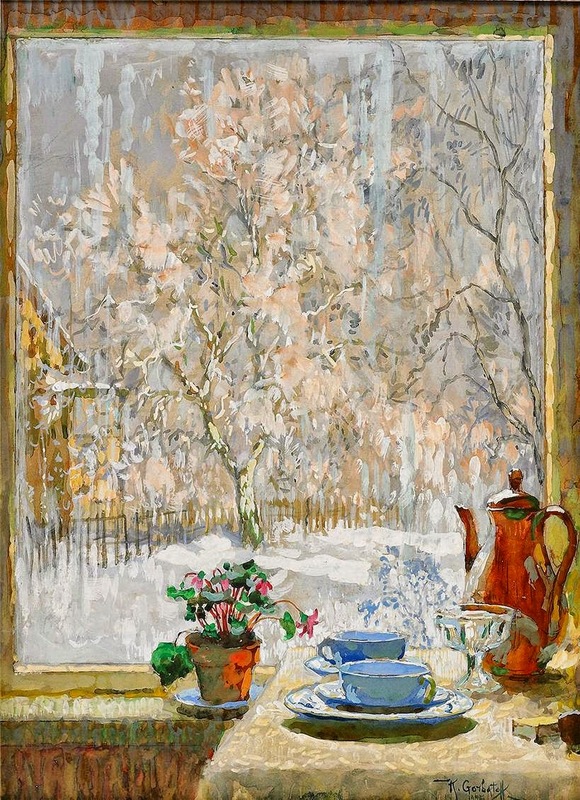 Gorbatov's brushstrokes are graceful yet bold, gesturing the tiny flecks of light that reflect the sunshine that shimmers through thetrees and softly illuminates the shadow-speckled patio. 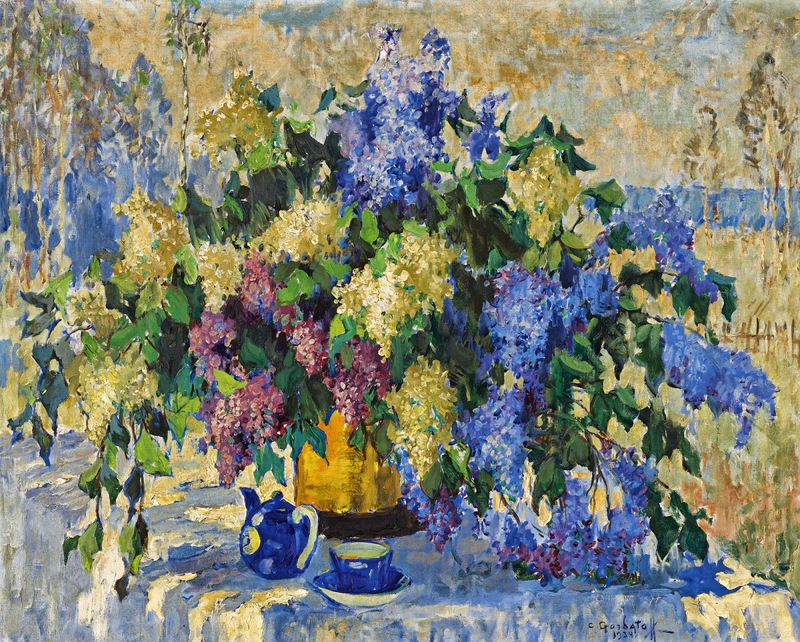 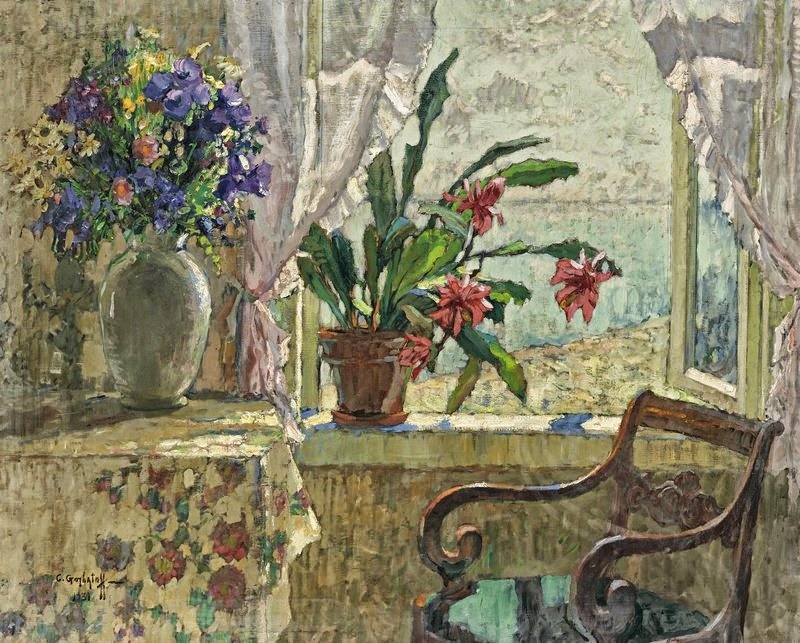 The mountains, sky and sea appear hazy in the distance, whilesplashes of vibrant oranges, reds and purples in the fabrics and flowers along the patio create focal points for the eye.In the year after he completed the present lot, Gorbatov left Capri and moved with his wife to Berlin. 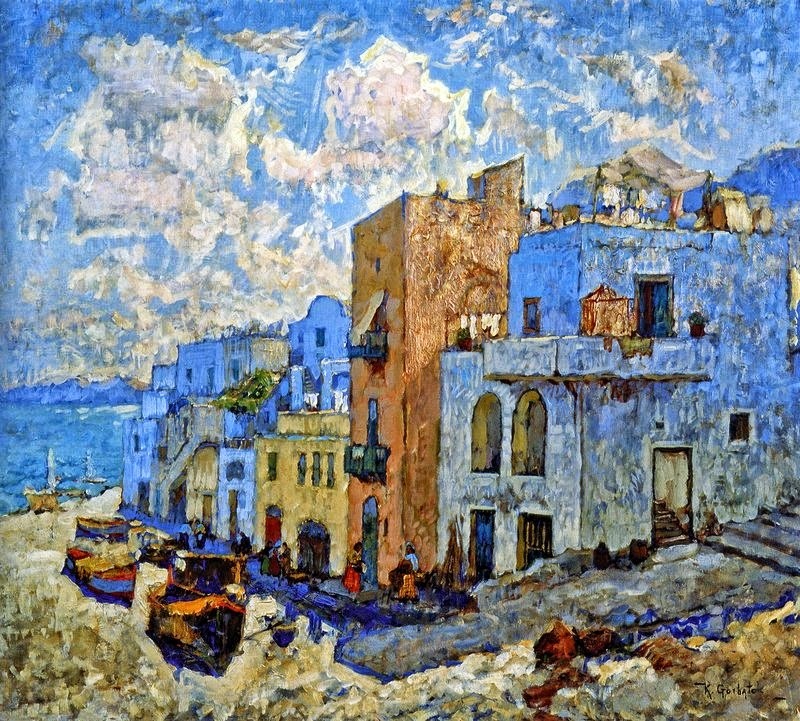 Despite this dramatic change in surroundings, he continued to paint Italian landscapes throughout the remainder of his career, and he returned annually to Capri and Venice until the outbreak of World War II. 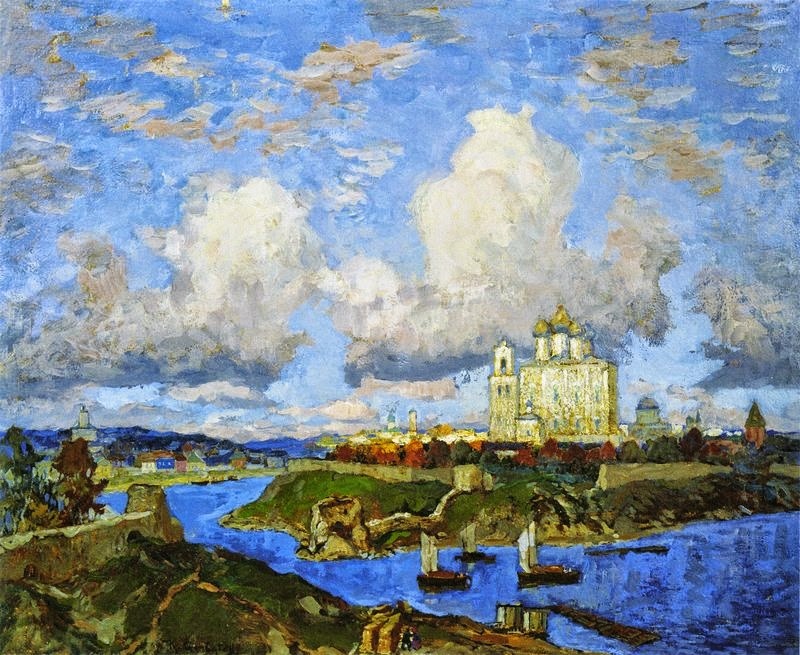 He moved to Berlin in 1926, where he remained until his death. 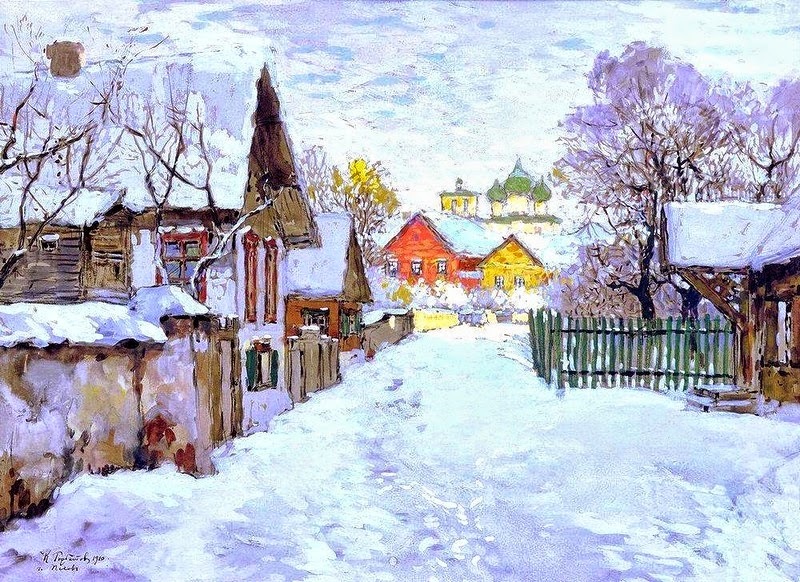 Gorbatov became a member of a Russian emgiree artistic circle that included Leonid Pasternak, Vadim Falileyev, Ivan Myasoyedov. 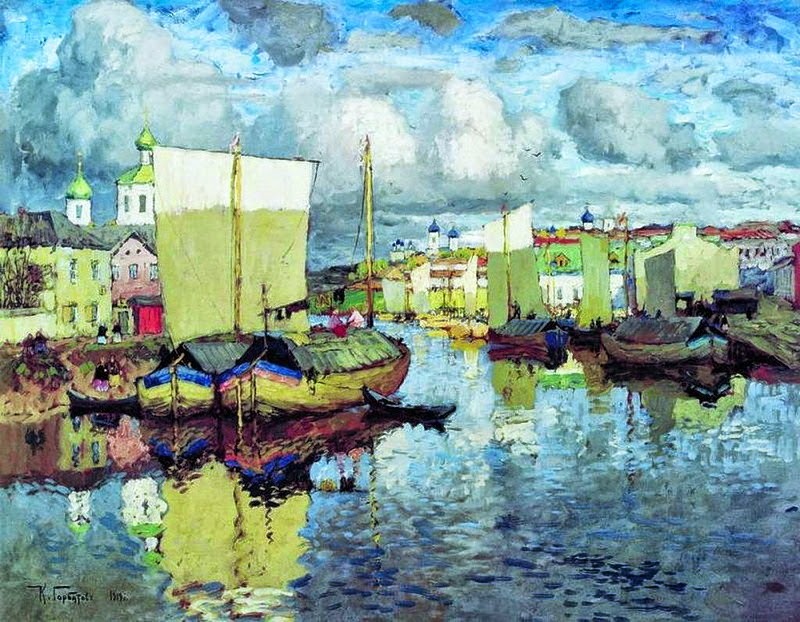 He became a well-known established artist. 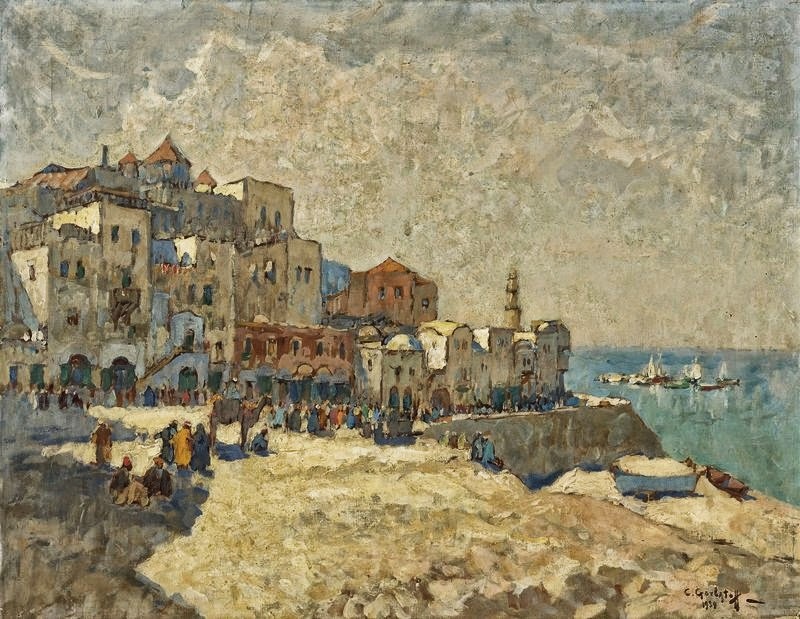 Gorbatov traveled throughout Europe during the late 30s, visited Palestine and Syria in 1934 and 1935, and often came by Italy. 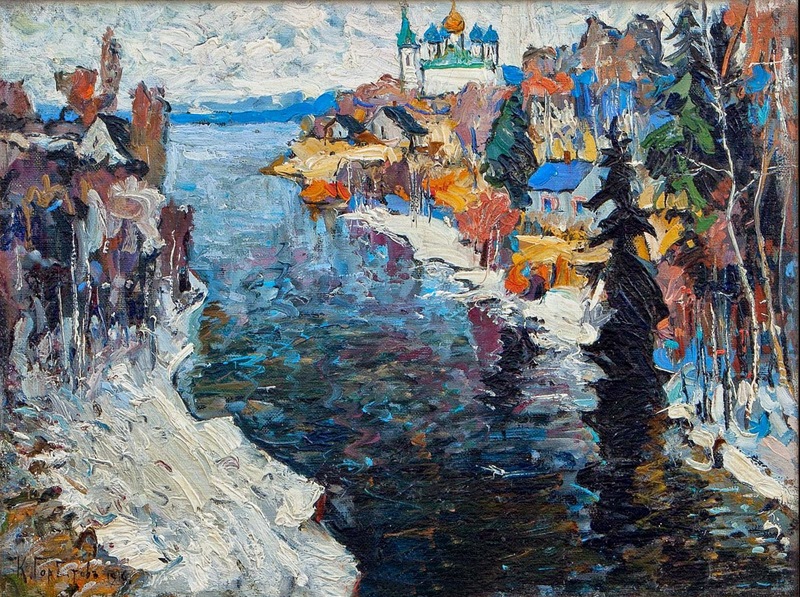 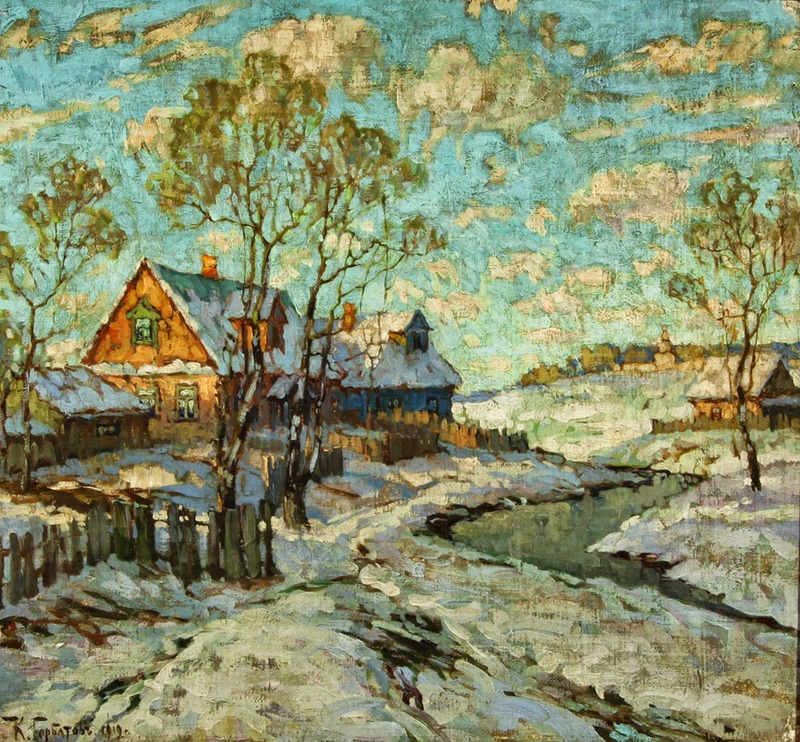 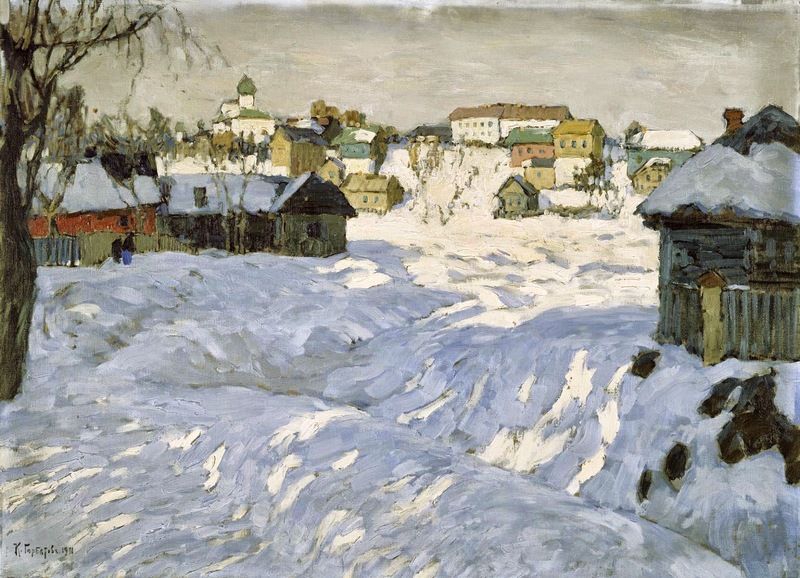 Gorbatov's art became unneeded in the Nazi Germany and the family soon became impoverished. 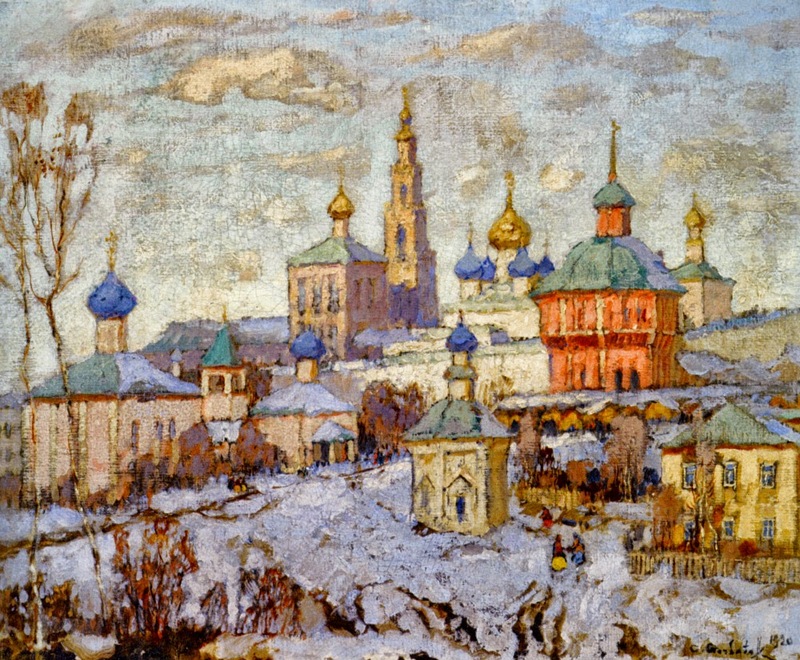 As a Soviet citizen he was forbidden to leave Germany during World War II. 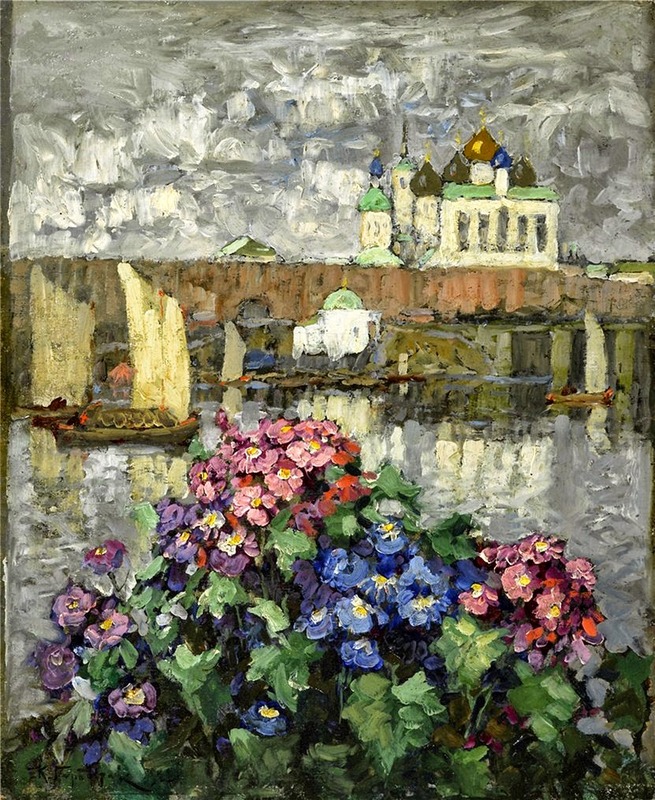 Gorbatov died shortly after the allied victory over Germany on May 12, 1945. 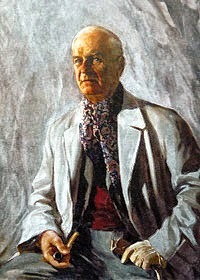 His wife committed suicide on 17 July 1945. 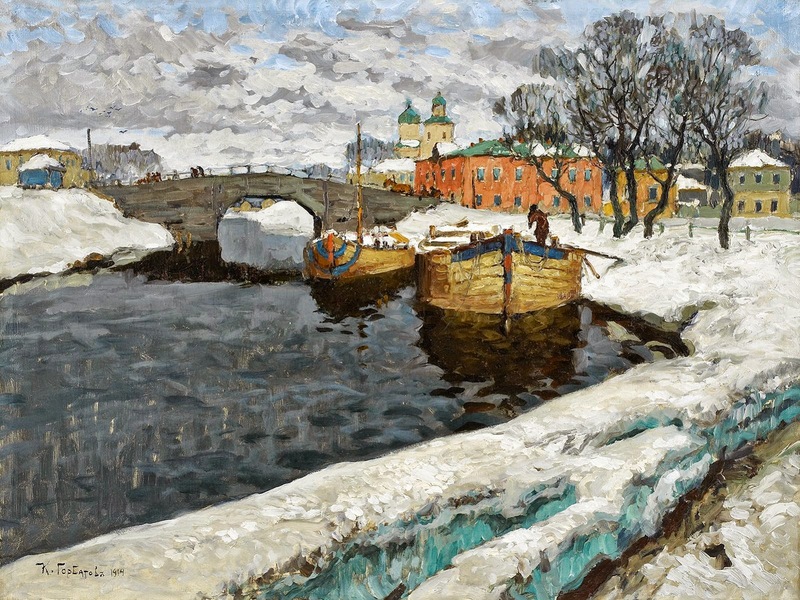 Gorbatov bequeathed to the Academy of Arts in Leningrad. 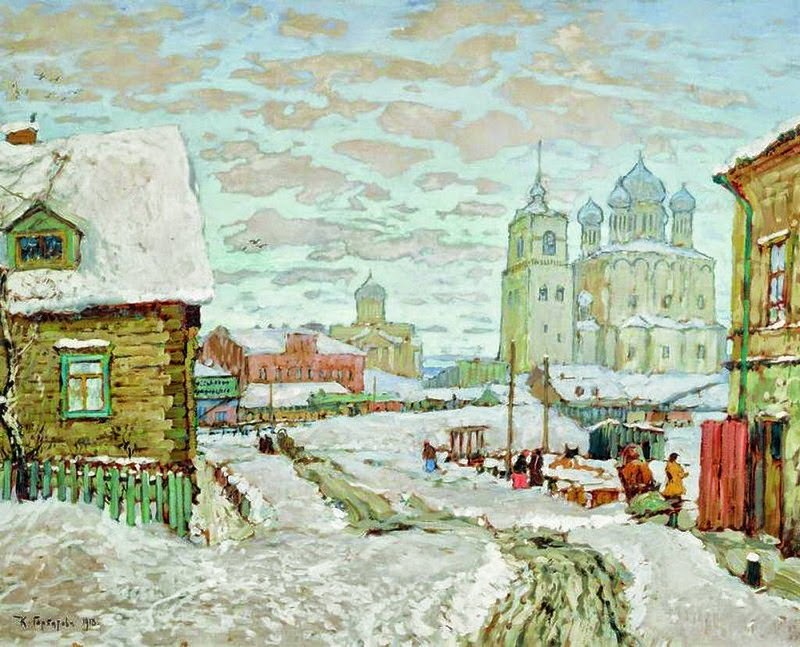 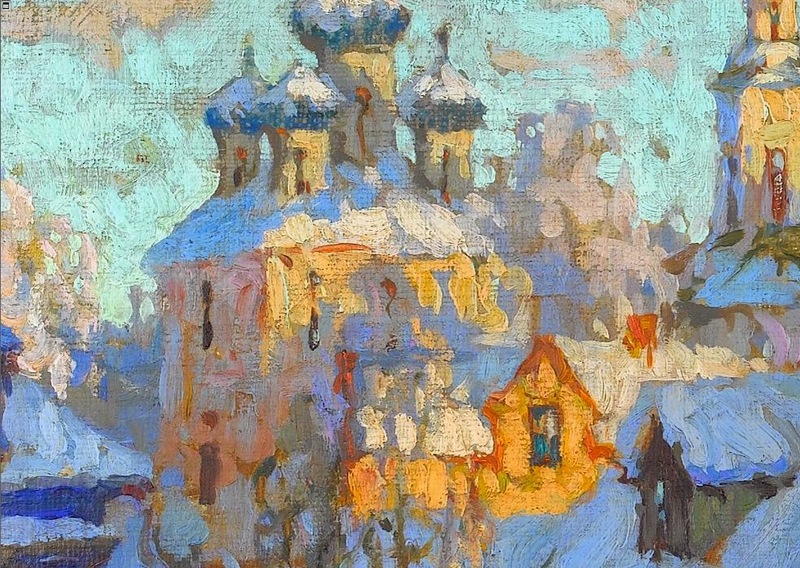 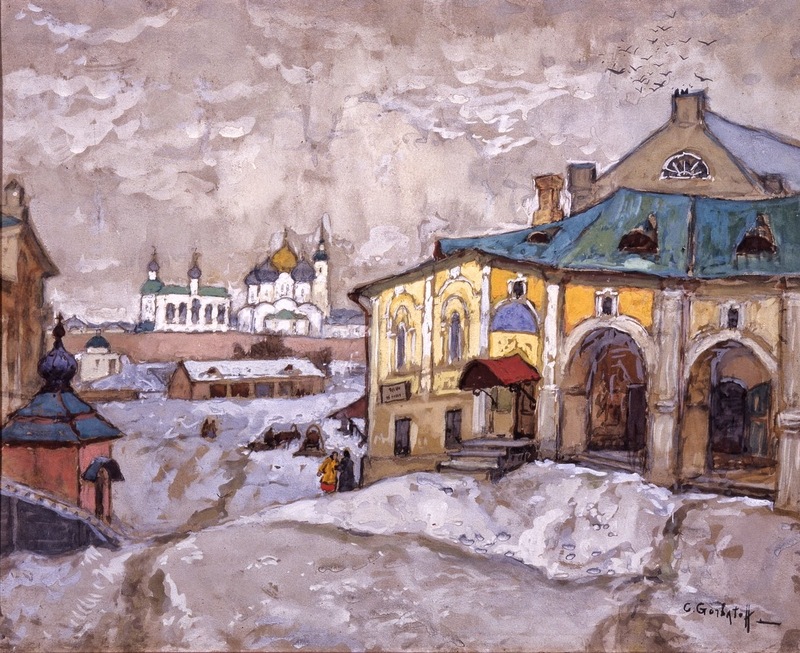 The works were delivered to the Moscow Regional Museum of history and Arts in the New Jerusalem Monastery where they are exhibited since then. 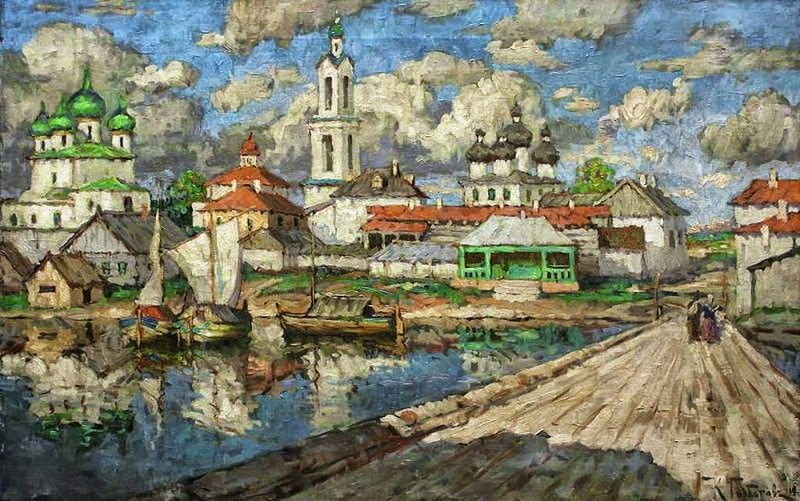 Luogo e data di nascita: Stavropol', 5 (17). 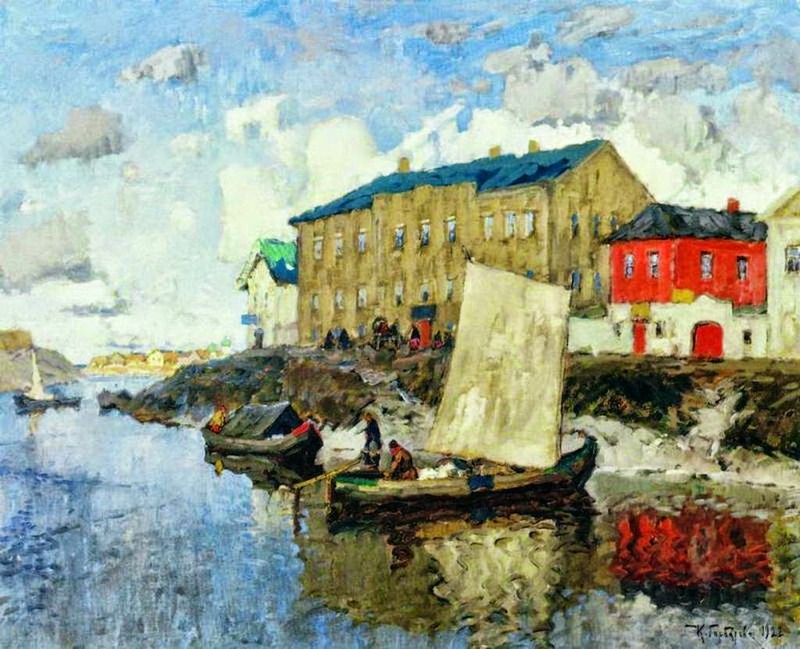 5.1876. 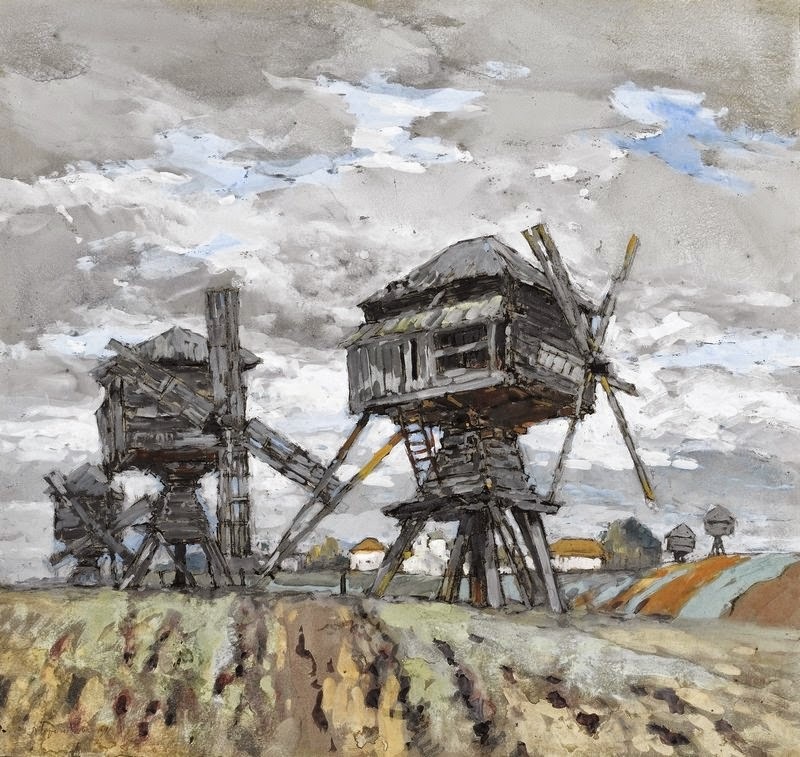 Luogo e data di morte: Berlino, 24.5.1945. 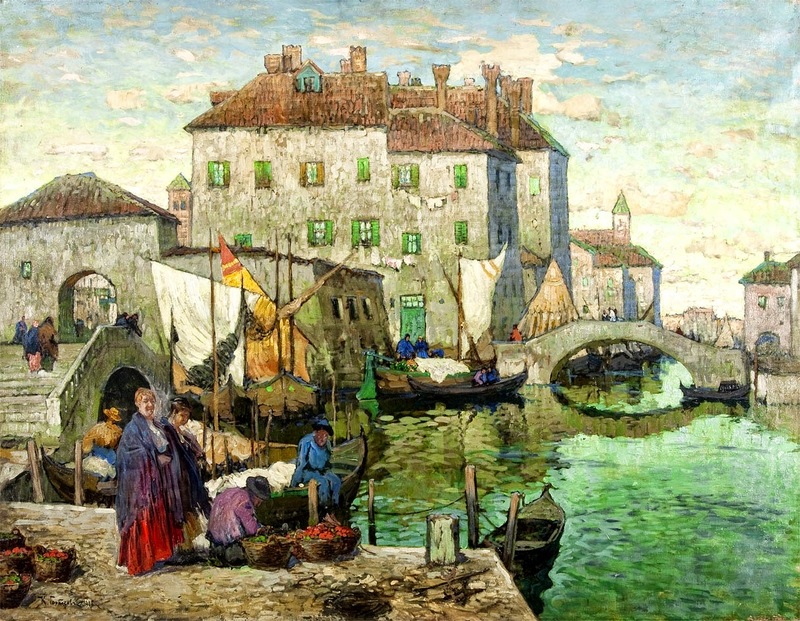 Negli anni 1904-1911 studia presso l'Accademia di Belle Arti di San Pietroburgo. 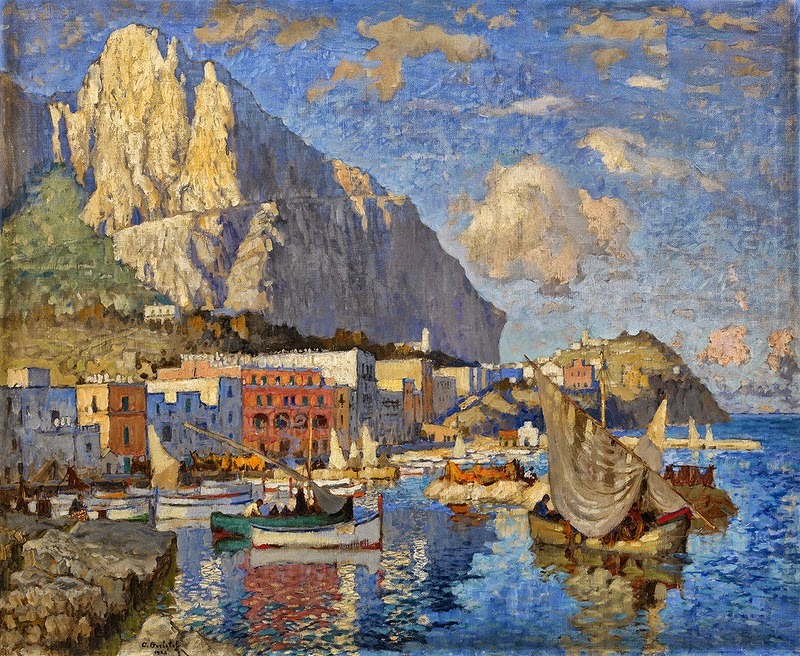 Nel 1911-1913 è a Roma come borsista dell'Accademia di Belle Arti e in questo periodo visita spesso Capri, dove stringe amicizia con Maksim Gor'kij e dipinge paesaggi del golfo di Napoli. 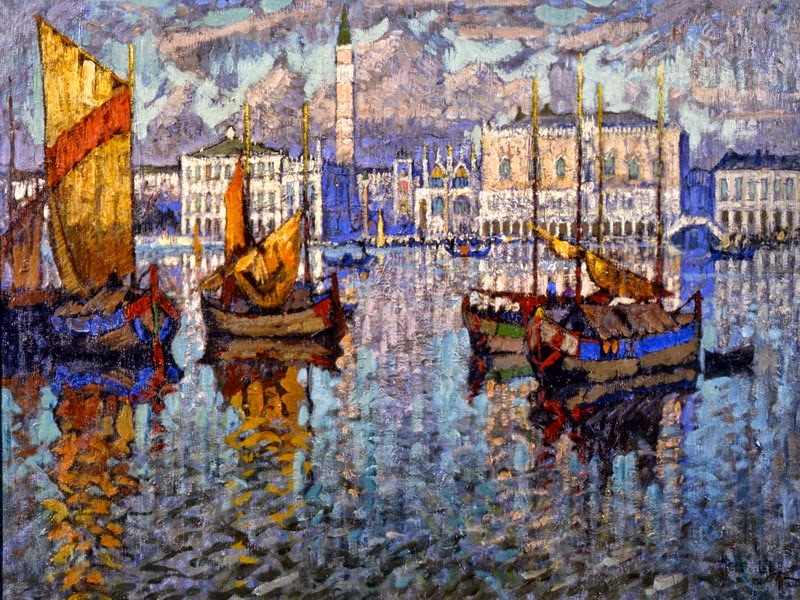 Come pittore è vicino alla maniera del Post-Impressionismo. 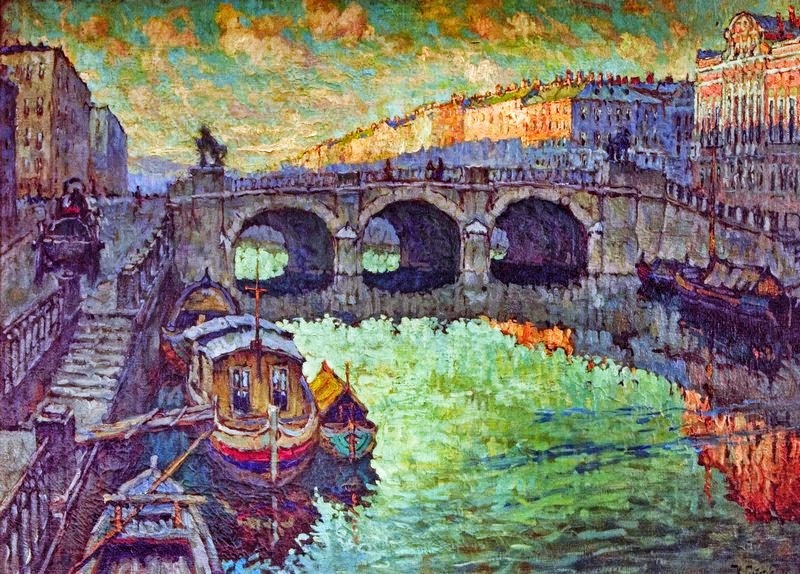 Nel 1911 vince il primo premio della Mostra internazionale di Monaco. 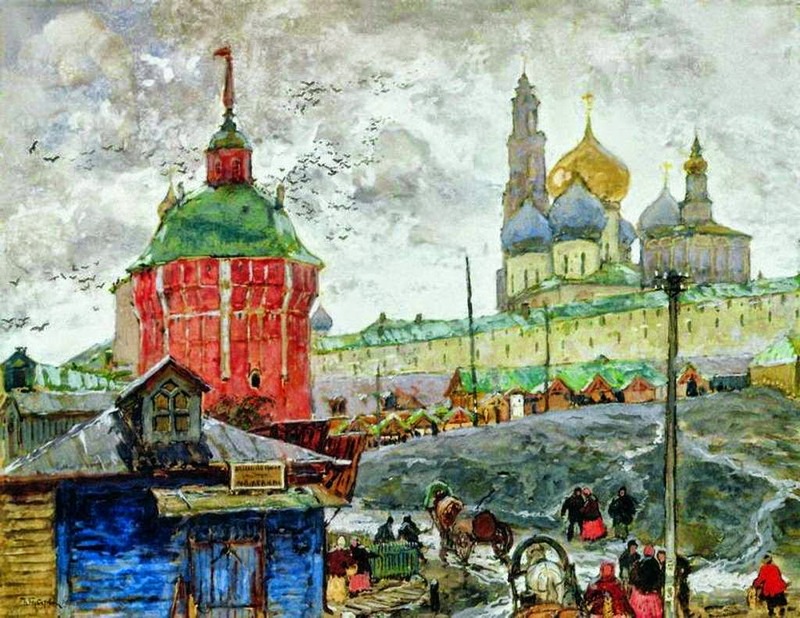 Dopo la rivoluzione d'ottobre, considerando soffocante l'atmosfera sovietica ma dichiarandosi apolitico, emigra nel 1921 con la moglie Olga in Italia. 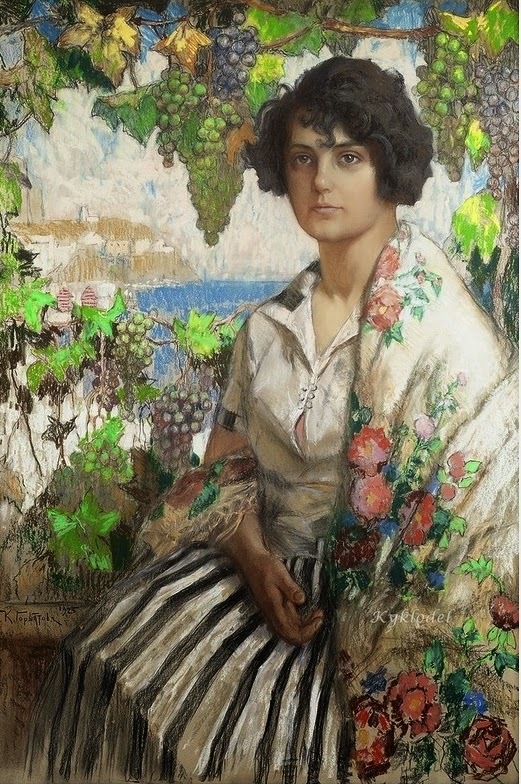 Tra il 1922-1926 vive tra Roma e Capri, dove creò numerose vedute dell'isola e della costiera amalfitana. 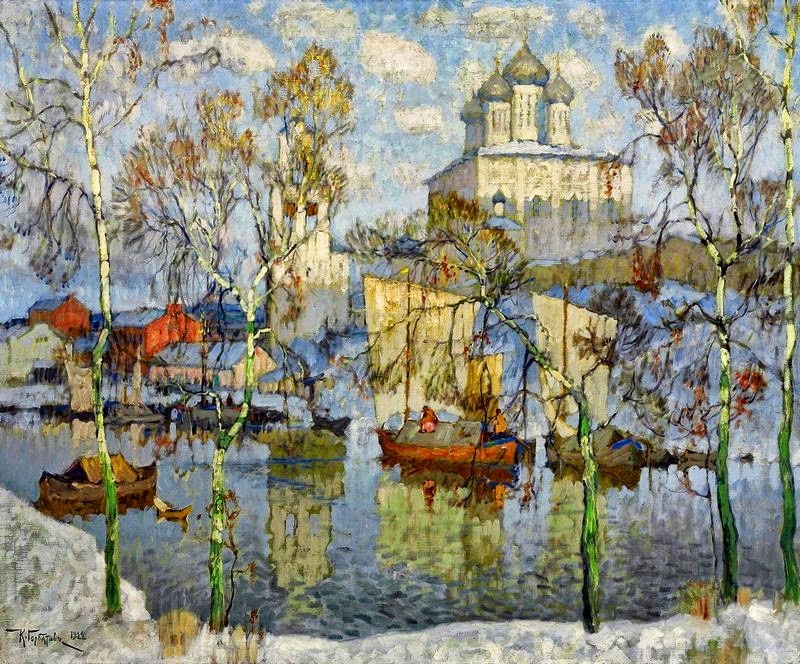 Ecco ancora la Russia: neve e grigiore: piccoli quadri. 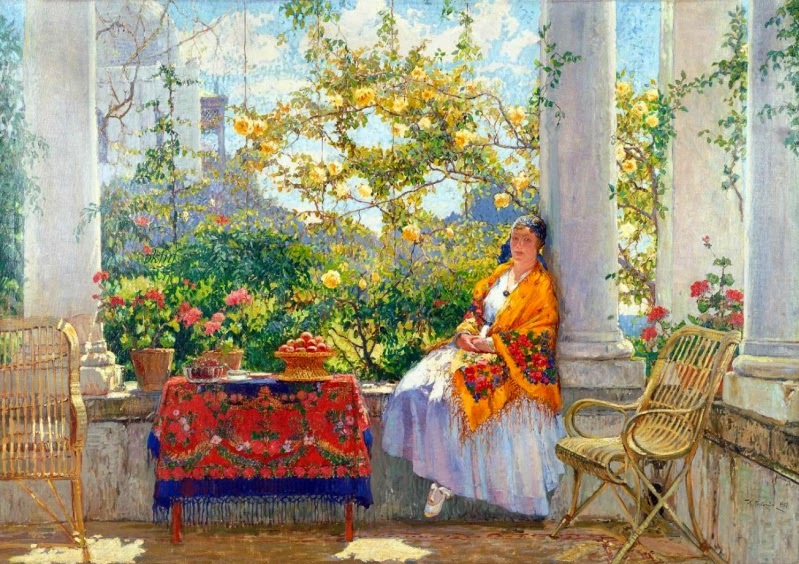 Ma vicino il nostro cuore dà un balzo di gioia, che ci chiama l'inno delle nostre gemme: Napoli, Capri, Amalfi, Venezia, Ravello. 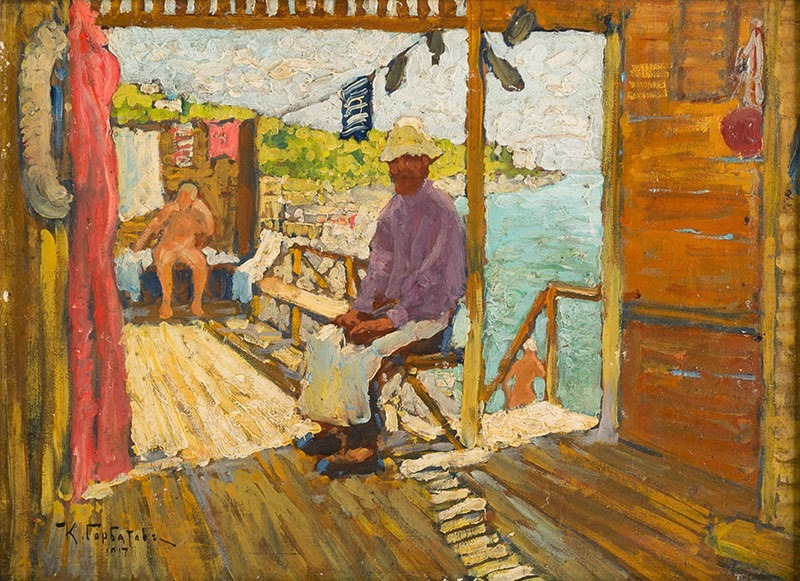 Tralci di vite, rami carichi di aranci, e terrazze al sole, sul mare nostro: le bellezze del paesaggio e la luce del sole hanno, direi quasi, abbagliato l'artista, che ha veduto bene, anche quando gli accenti della sua calda passionalità, l'hanno portato ad apparenti esuberanze - E. Pennetta, La mostra del pittore Gorbatoff, "Il Messaggero" 14.3.1926. 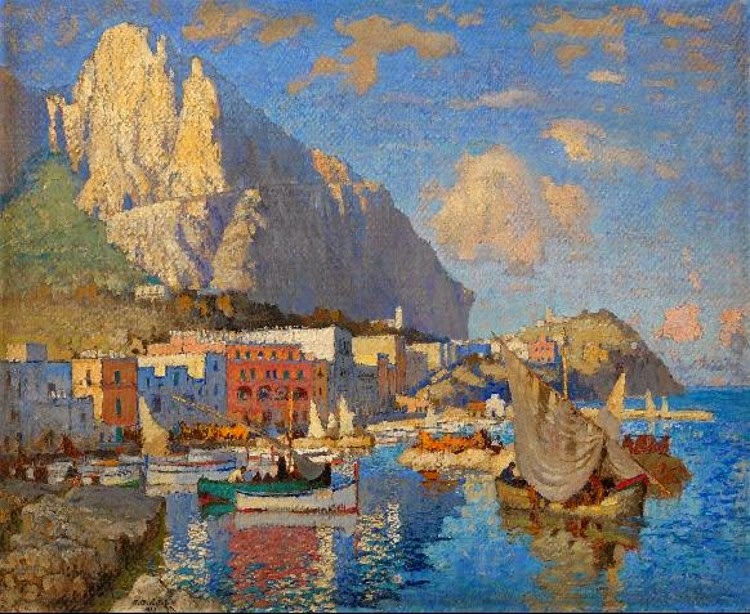 Il successo gli porta anche richieste di dipinti da parte dei Savoia e di diversi comuni (Capri ed altri). 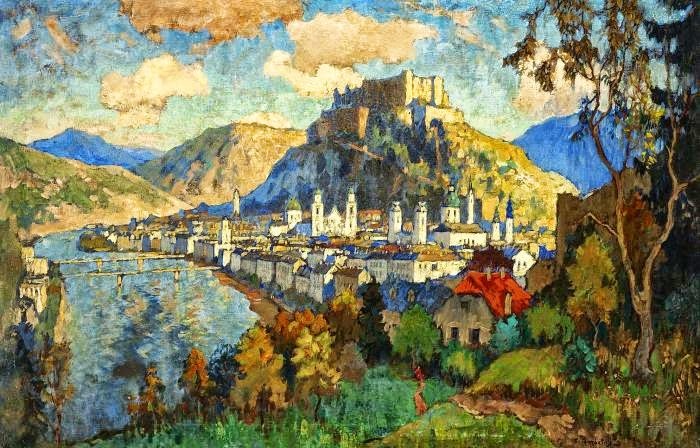 Dal 1926 gira per l'Europa, seguendo le sue mostre personali a Berlino, Amburgo, Monaco, Dresda, Copenaghen, l'Aia, Londra, ma vive soprattutto in Germania. 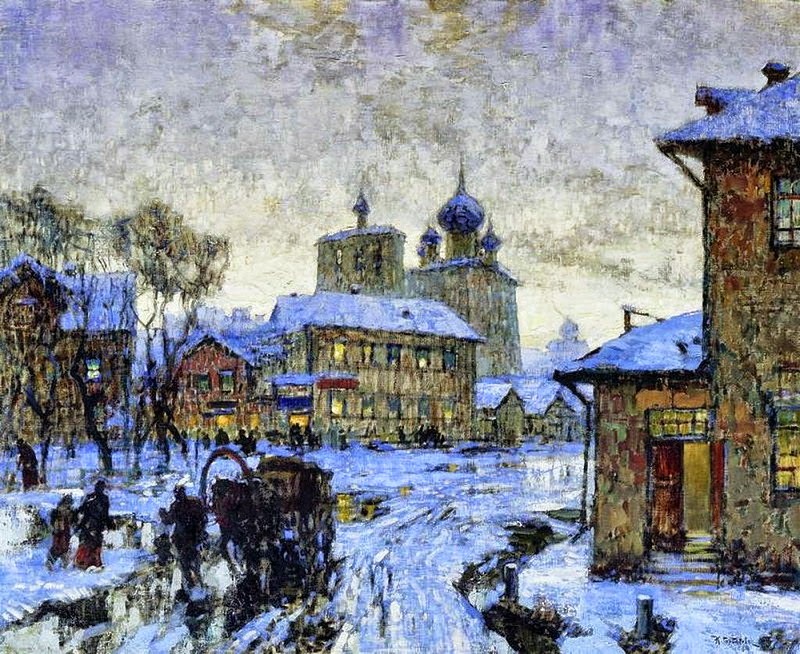 Dal 1940 è costretto a risiedere stabilmente a Berlino sotto il controllo della Gestapo.